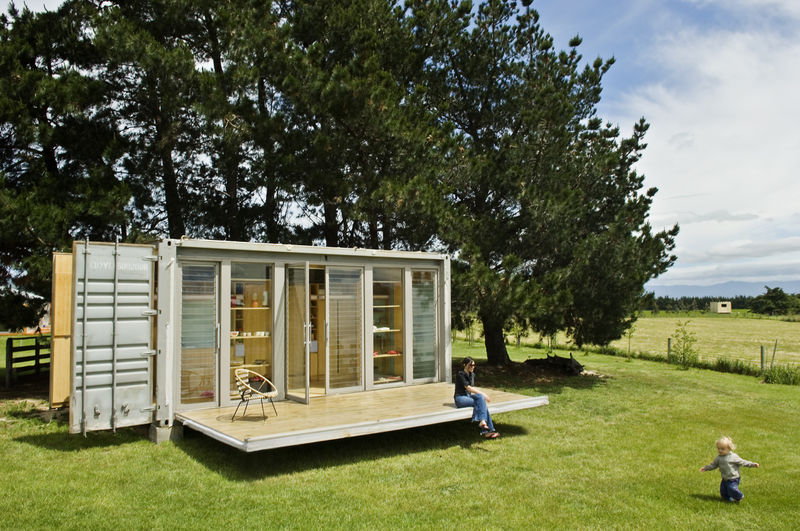 Most people have a home from containers associated with simple cabins, temporary summer housing. 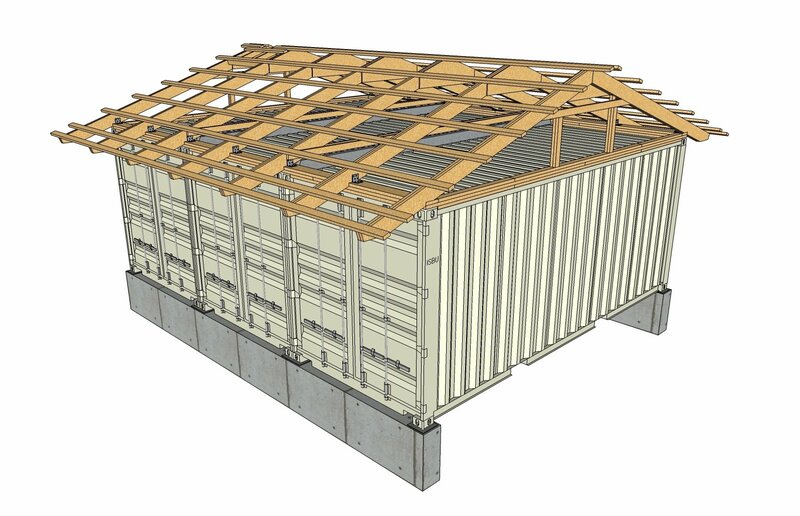 In fact, the structures can hit an unusual appearance that depends directly on properly prepared project design intent. This type of construction is extensively used in European and American countries for several decades. In the post-Soviet space, it is only beginning to gain momentum. 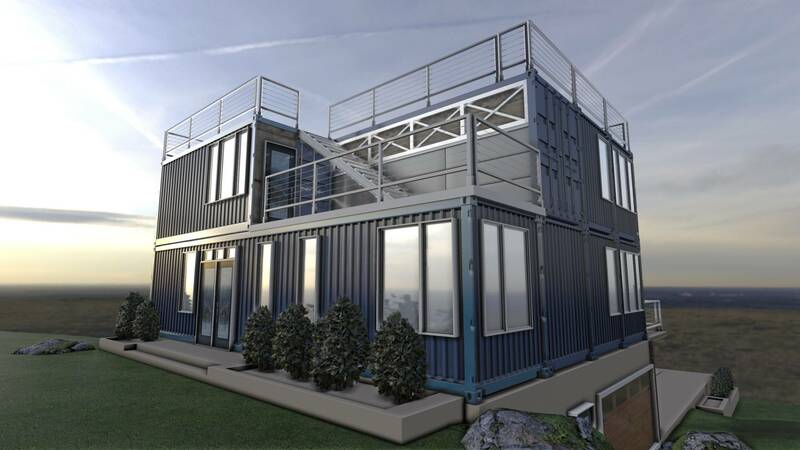 Of reusable containers intended for the storage and transportation of different items, you can build a multi-room, multi-storey buildings. 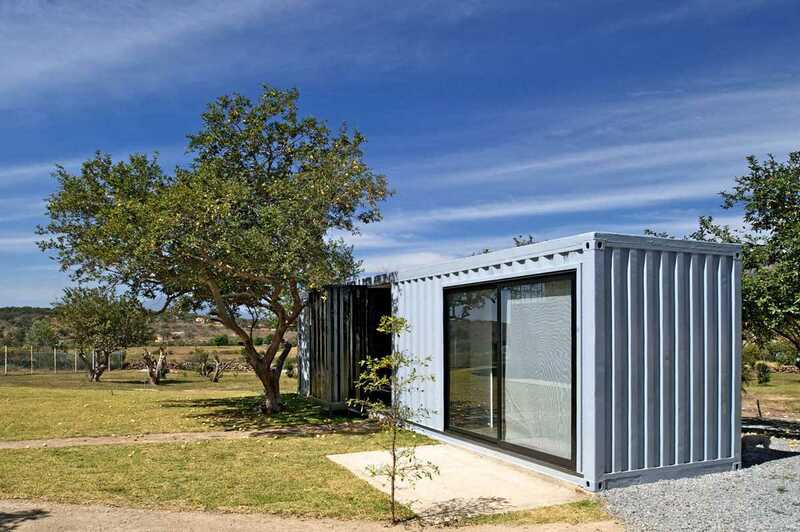 In the conditions of constant growth in property prices, this option will be a worthy alternative to standard buildings, built of the usual materials. 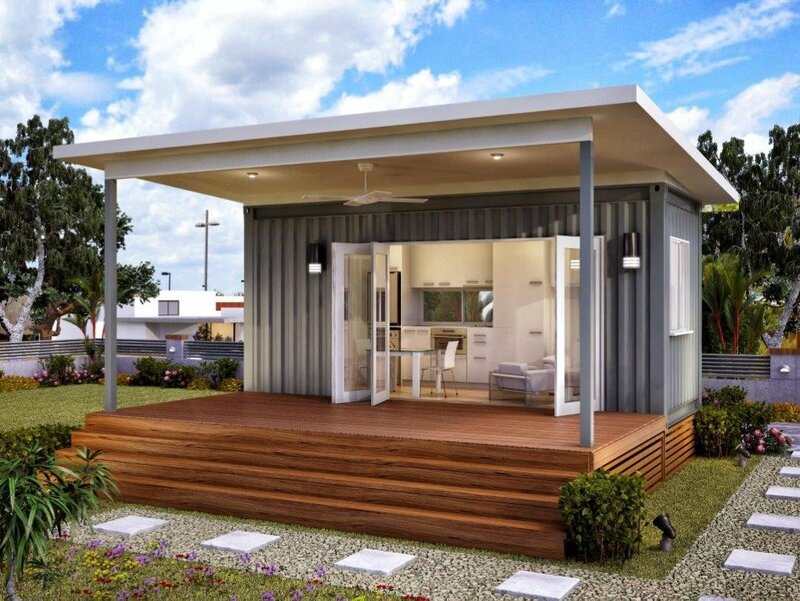 At minimal cost of funds for the construction work, it is possible to obtain functional, comfortable, cozy residential construction. 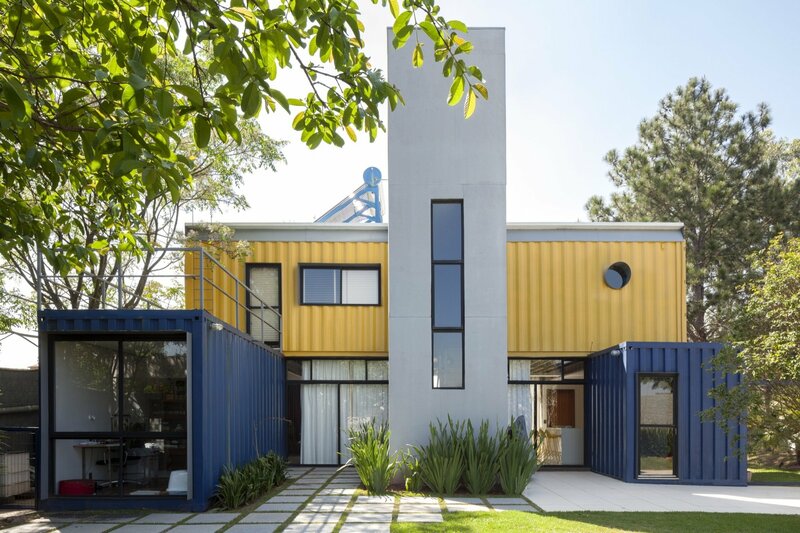 Containers became popular after the Second world war. The first model, which no loading/unloading of content it was possible to overload from trucks to rail or sea, developed in the 1950-ies Malcolm McLean. In April 1956, was carried out a trial shipment, and then started the container revolution. 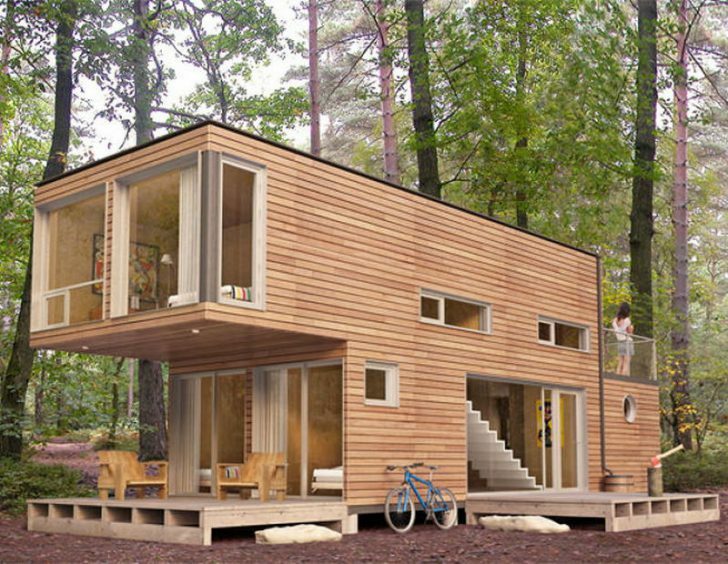 It is unlikely that the entrepreneur thought that his invention will be used as a dwelling. When and under what circumstances began to use these designs for residential buildings, it is impossible to determine, the founder is unknown. The first mention of the possibility of using products as temporary housing found in the archives of the U.S. Army, the document from 1977. 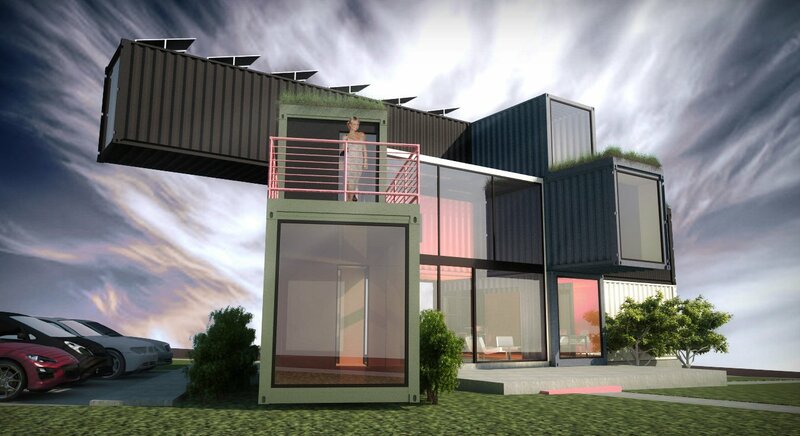 Later, in 1987, Philip Clark has applied for a patent, an American architect proposed to build housing from reusable packaging. 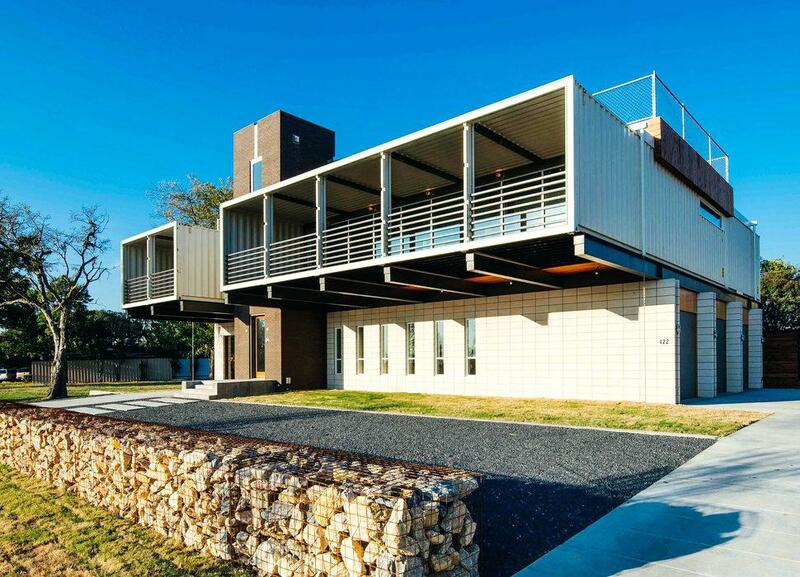 However popularized this type of construction became the father of container architecture, Adam Kalkin. 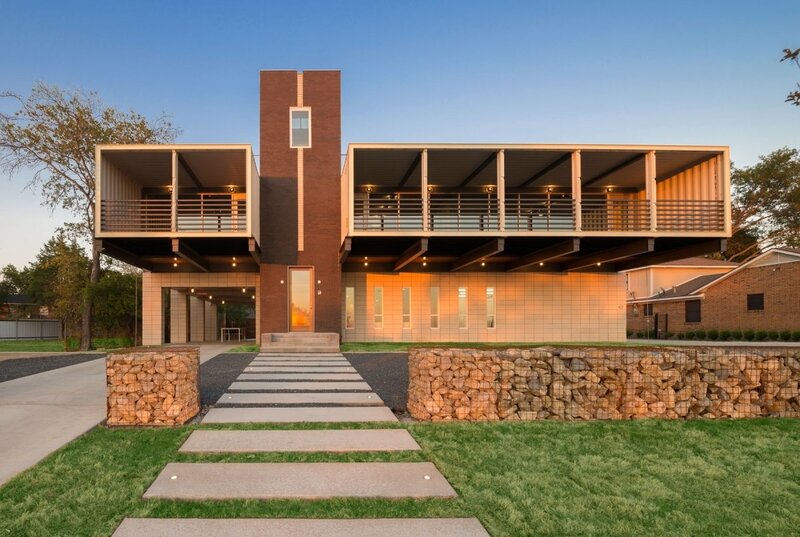 This is one of the most Orthodox practitioners of architecture, who calls himself an artist. A graduate of English Vassar College, studied architectural art in London. 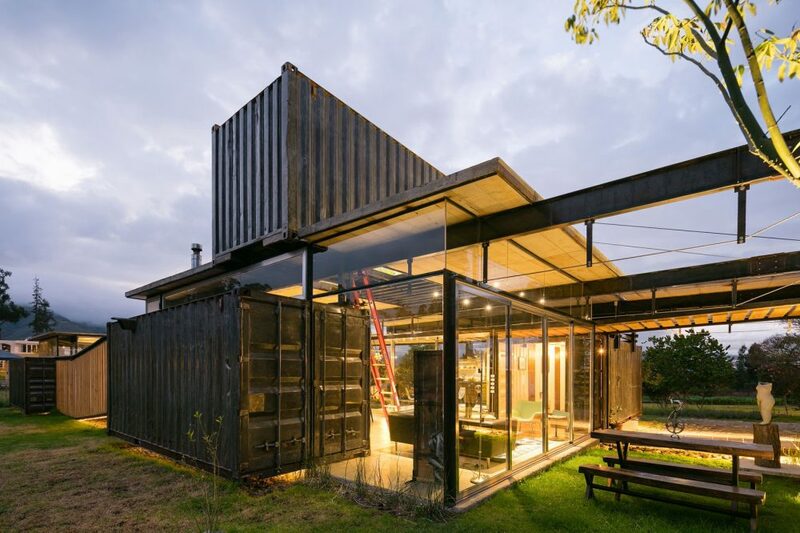 Containers started to be engaged since 1992 in the state of new Jersey, USA, and subsequently founded the firm that became known worldwide. Build a structure of modules under the force of each, you do not even need special education. Good enough to study the topic, understand the technology. 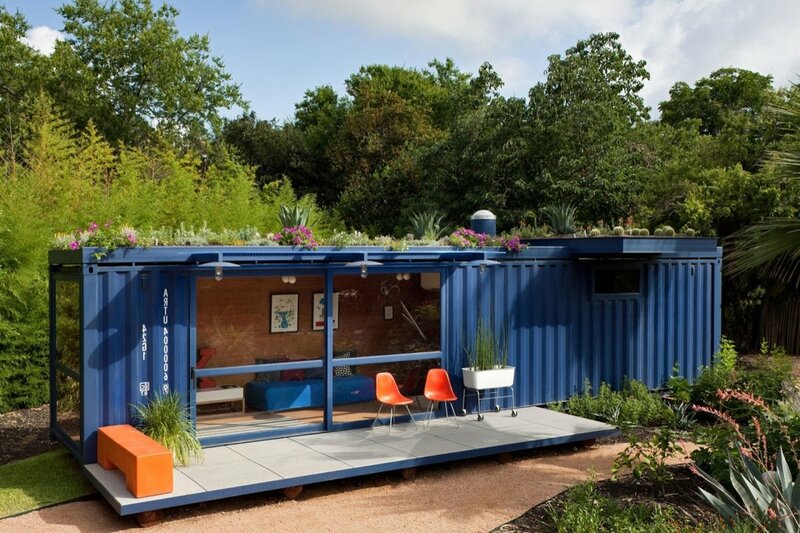 Containers give endless opportunities to create interesting projects. 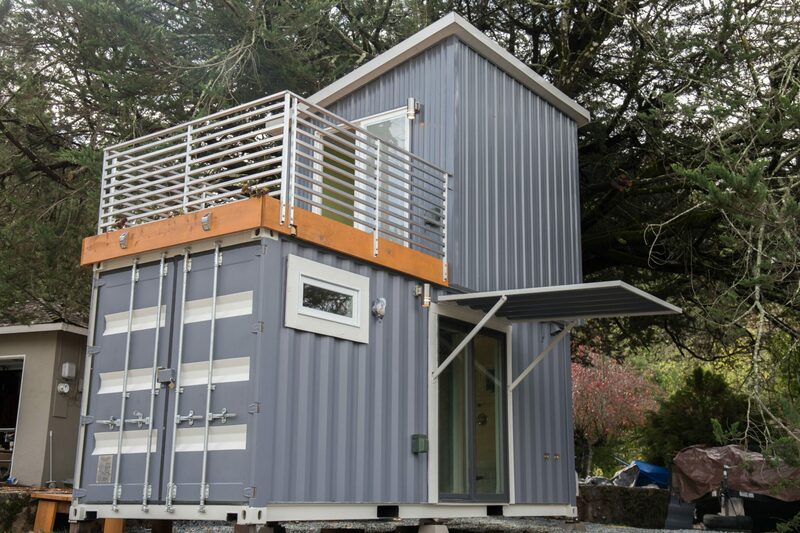 The building has a block structure, can be welded or collapsible (convertible). 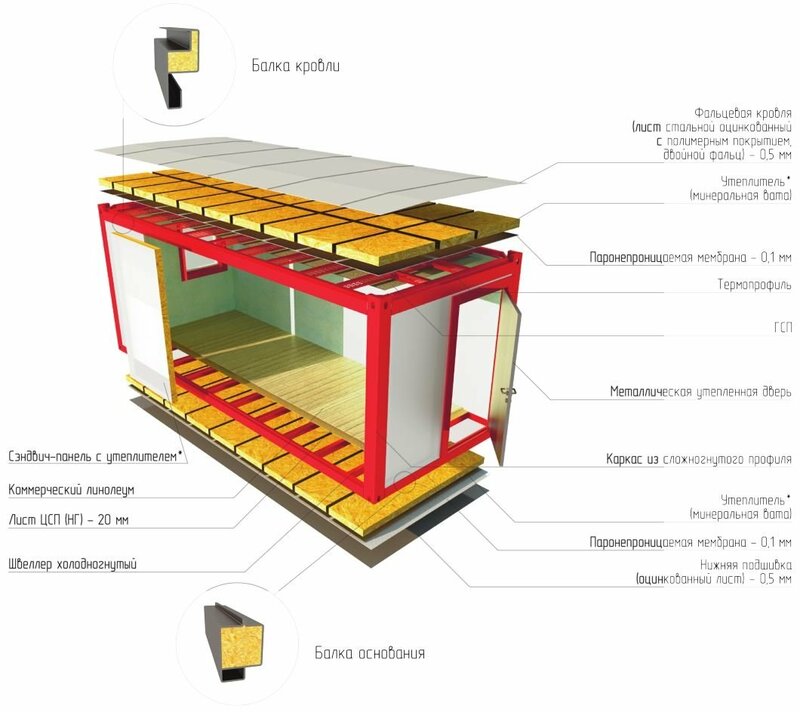 Each element of the model that cannot be represented in a standard house. 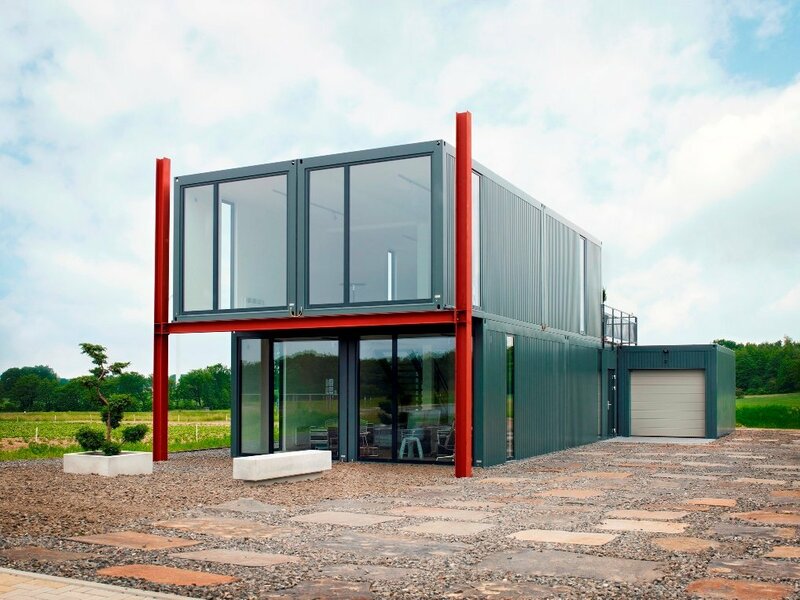 Container buildings can be used seasonal and year-round. 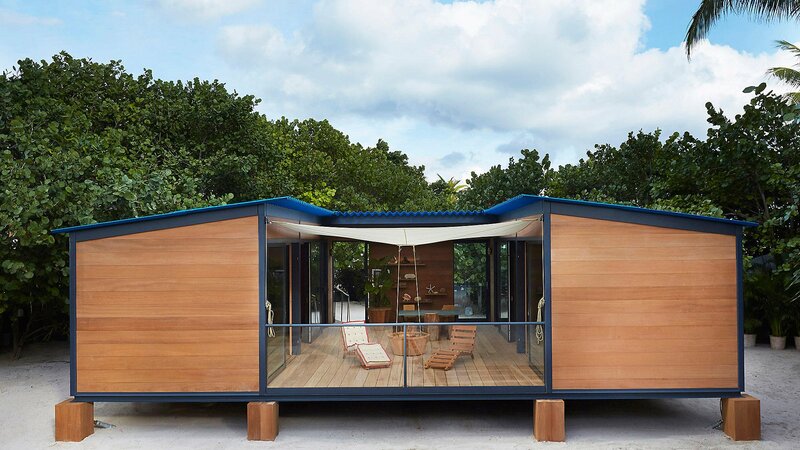 In the construction of temporary housing does not require any documents. For permanent residential buildings will have to issue the building permit. 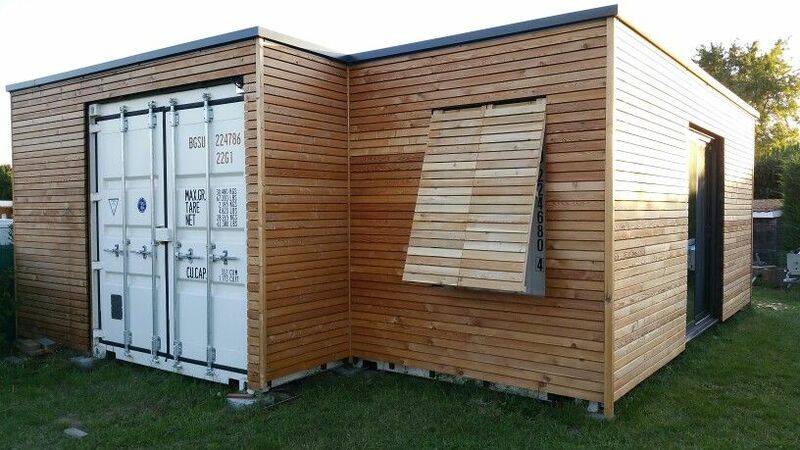 The construction of reusable packaging is also called prefabricated housing. During the construction created by the sketch are selected different blocks, which make up the structure. 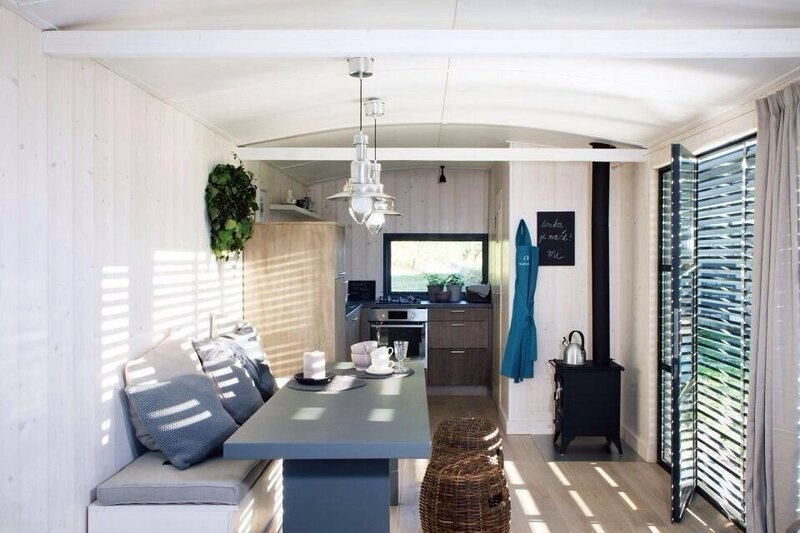 Folded from some parts of the cottage are cut out window and door openings, it electricity, plumbing, communications, gas, which is also necessary to obtain permission from the relevant service, or use gas cylinders. 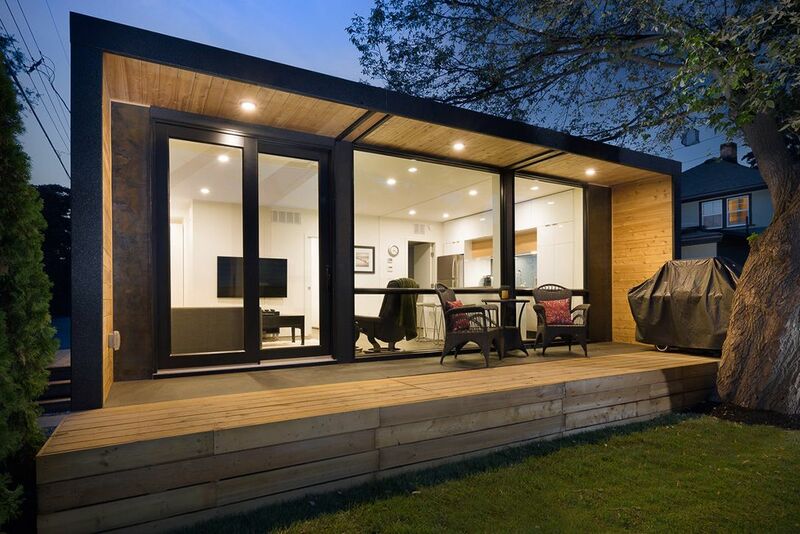 The main feature of all buildings constructed from this material, is a fixed rectangular size of the rooms. If the length can be adjusted by cutting the elements into individual components, the value of height and width constant. Of course, applying it in different size models, it’s easy to get a good result, however, their diversity is small. 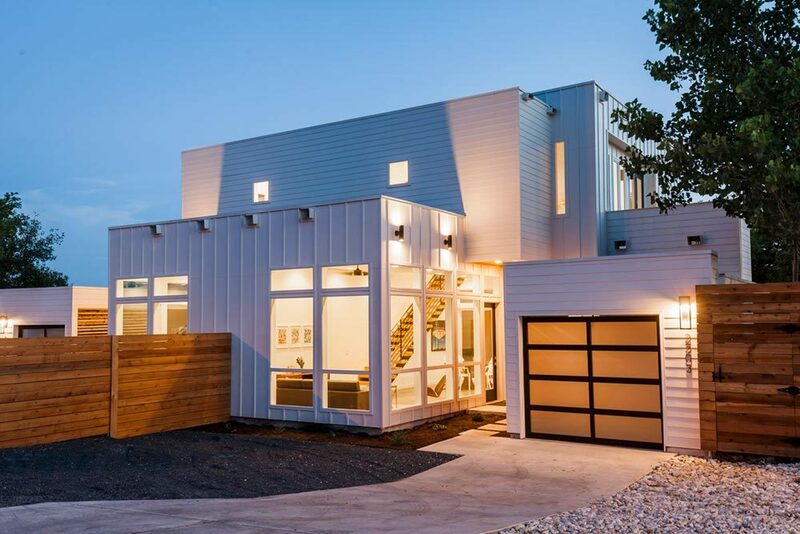 And when construction of a permanent dwelling will only use options that are appropriate for the size of the current building codes and Standards, otherwise the project will not be registered in the BTI. Strength. Due to this quality they are used in seismically dangerous areas, in places where there are hurricanes, tornadoes, other natural disasters. Light weight. The mass of the product is small, therefore, does not require major Foundation. The speed of construction works. 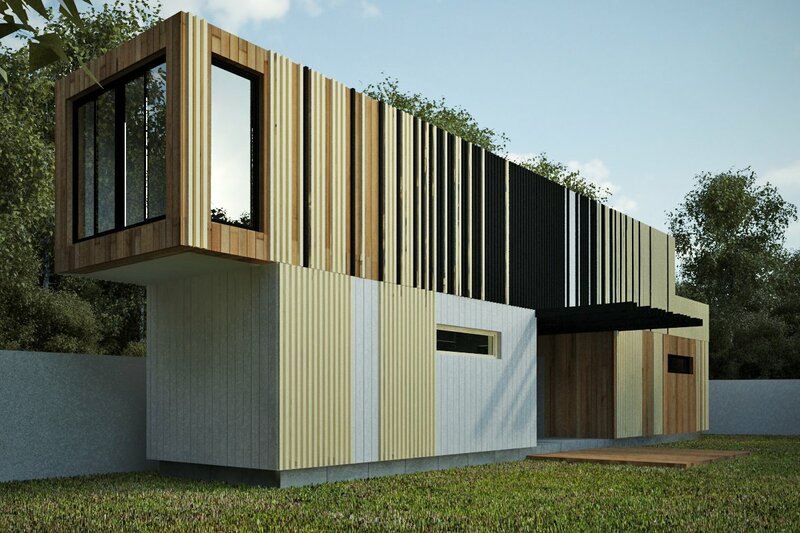 The construction of the house will not take a lot of time even complex designs can be finished in 2-3 months, including external and internal finishes. Mobility. 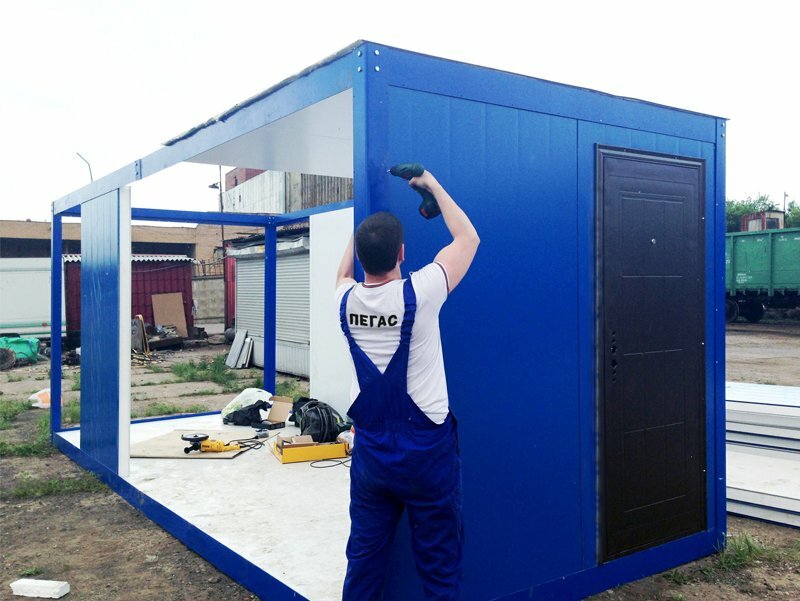 If necessary, a building can be disassembled and reassembled, transported to another place. Innovation and creativity. The original design differ in their appearance. Durability. 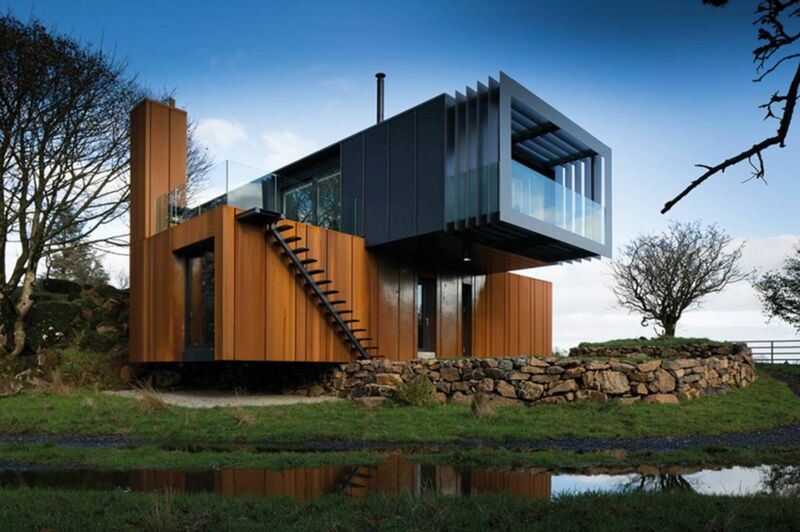 With proper care, periodic maintenance, the house will stand for long. Versatility and practicality. Blocks can be combined with other construction elements to include in the project concrete, brick, wooden buildings. Protection from unwanted fauna. 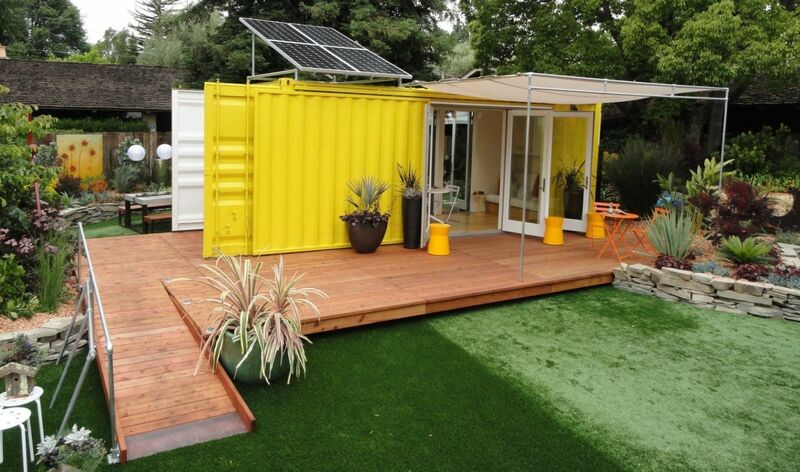 In an airtight container will not be able to penetrate insects and rodents. The possibility of completion. 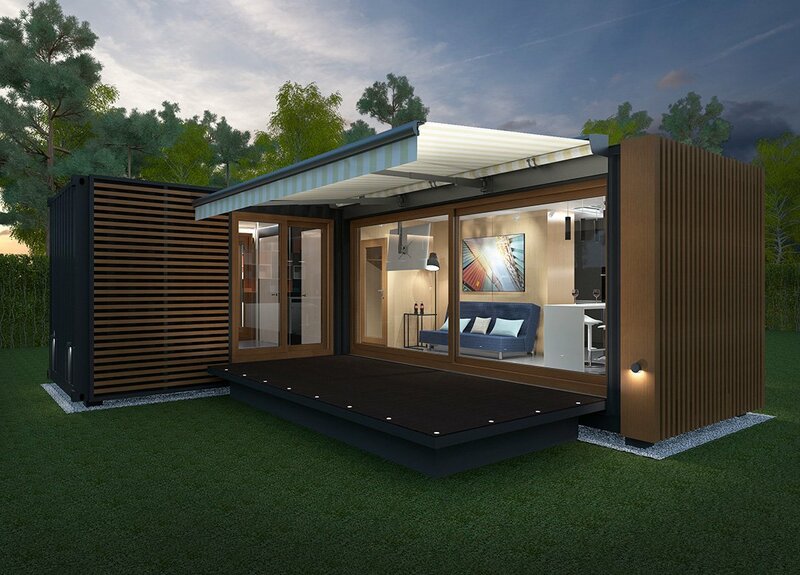 At any time you can increase living space, add a new module. Toxicity. Elements designed for transporting cargo, are treated with chemicals that protect the surface from adverse weather impacts. You must remove the toxic layer. The fixed parameters. 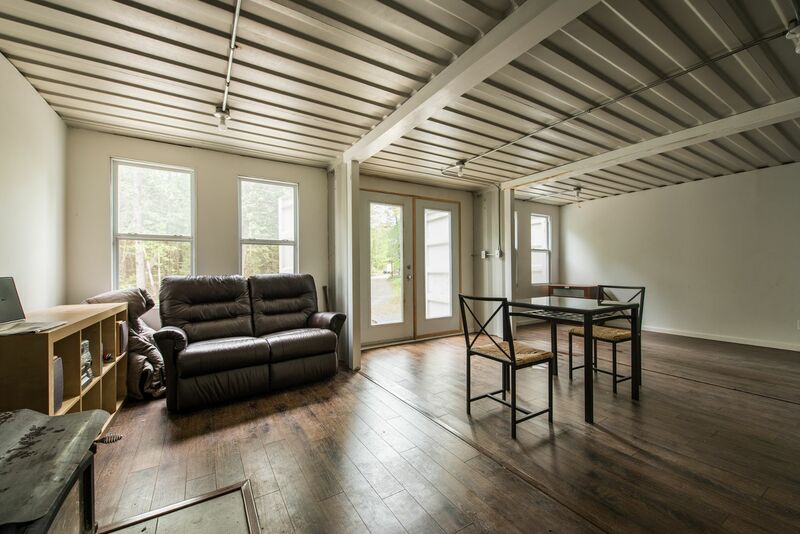 You cannot change the height of the ceilings, width of the interior space. Coefficient of thermal conductivity. Metal heats up very quickly and does not retain heat. You will need very good insulation. Tightness. The material is not breathable, does not “breathe”. For a comfortable stay, you should organize high-quality ventilation. Corrosion. For life extension have to constantly inspect the state of the surface, to eliminate the various defects. Technical condition. Hard to find Tara on the secondary market that would meet the requirements, had no significant flaws. Seasonality. Most of the projects are not designed for residential properties. Budget options for the comfortable existence of a full family. The price of the main item may be different. For the purchase of a new product would require more money than a used model. Also take into account the technical condition of the object, the place of sale, for example, in the port cities it can be purchased inexpensively. Pricing depends on the kind of the product, its basic parameters. 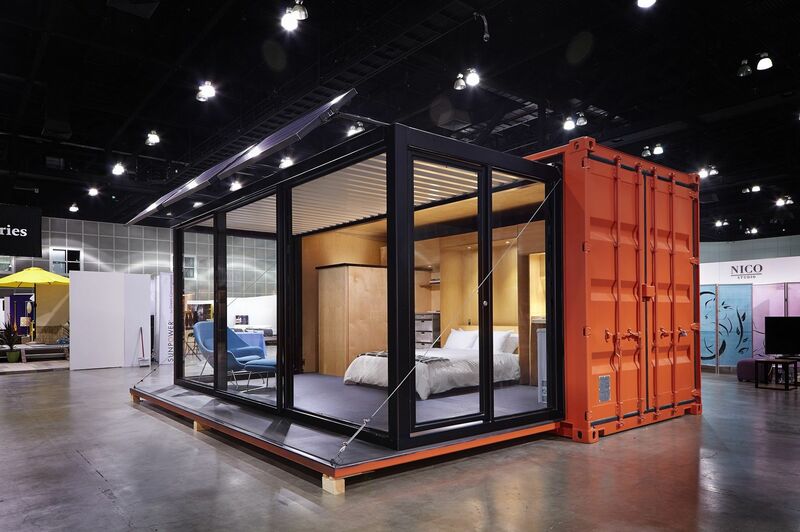 The cost of transportation can be comparable to the price of the container. But the biggest investments have to purchase materials and pay employees. 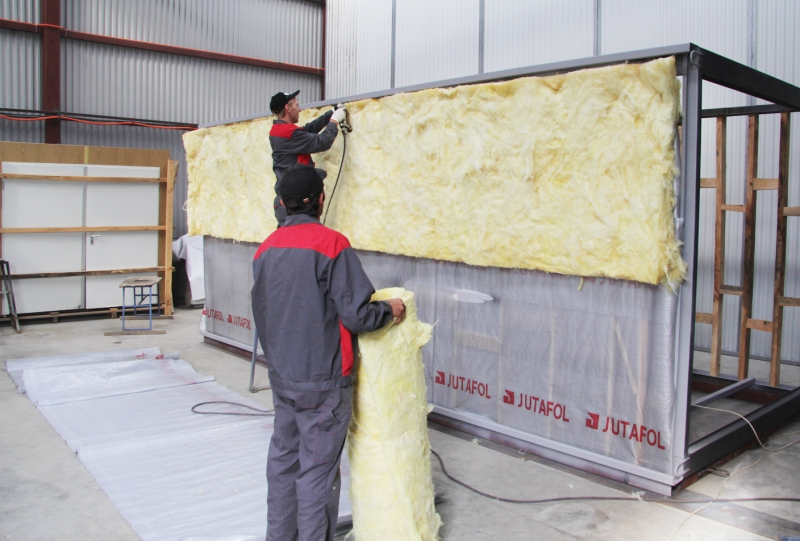 In the construction of sturdy, suitable for permanent living house, do not skimp on the insulation, the insulation requires additional investments. 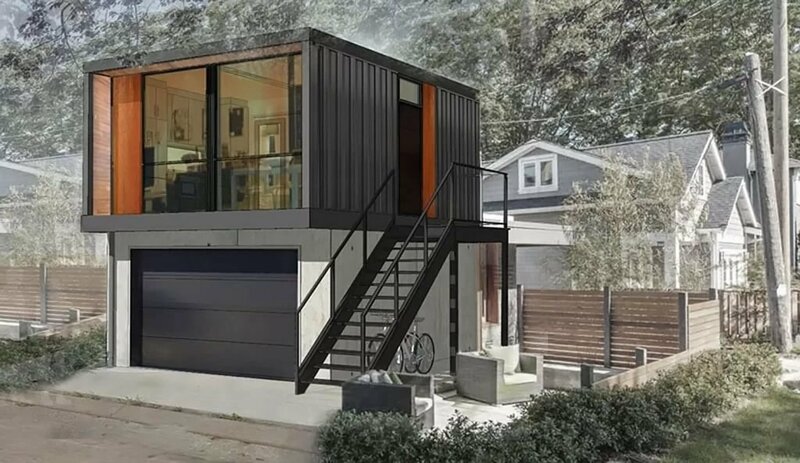 Costs of construction of the container building will be 30-50 % less than for the construction of houses made of traditional materials. 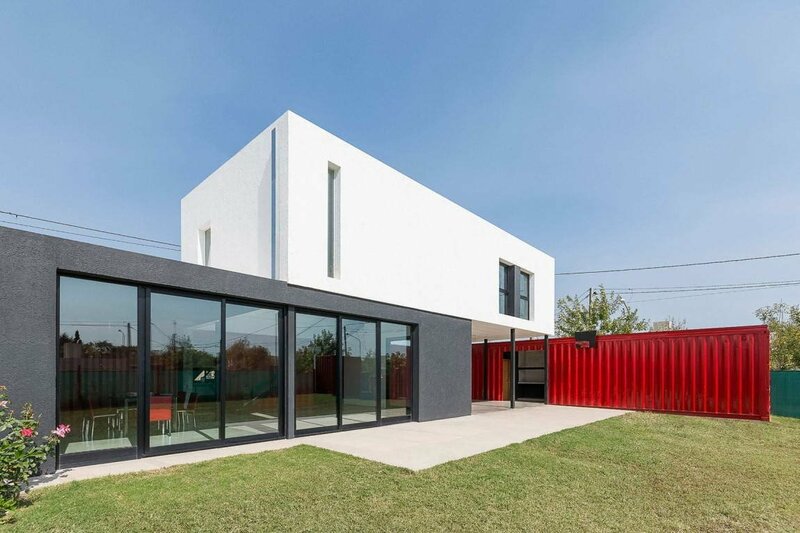 With containers, you can build creative, unique house that will meet all the requirements of the owner, to surprise the neighbors, bystanders. 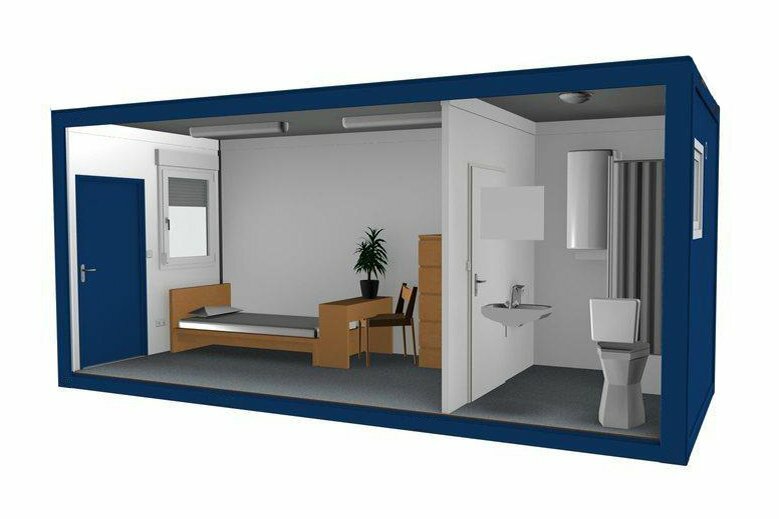 To compile the project, perform the layout of the rooms can do with their hands or seek the help from professionals, download ready-made scheme online. 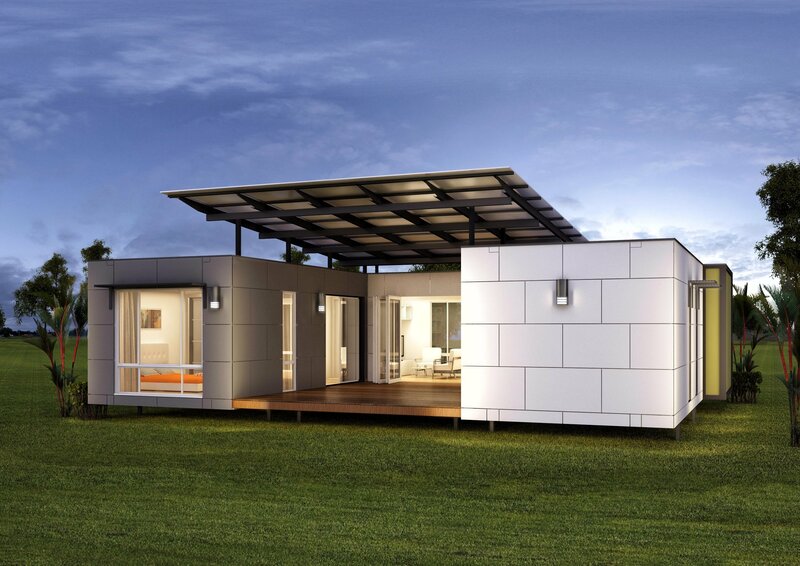 Depending on the functionality, purpose, and financial capabilities, you can build a residential building even one module. If you use multiple units to have a full home. 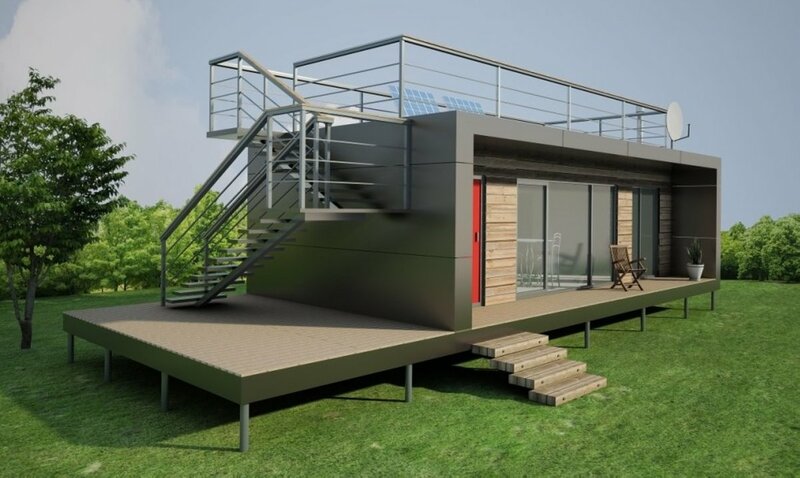 One can build the structure in one, two, three floors, suitable for seasonal use or for permanent residence. 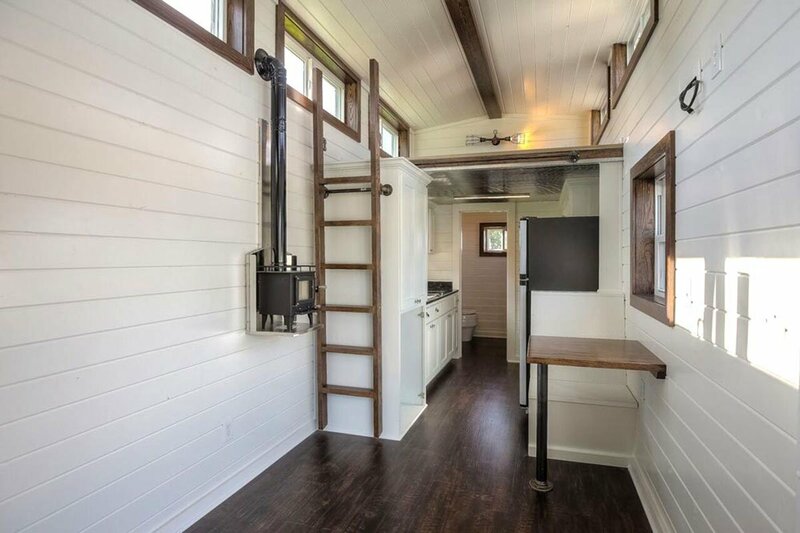 If desired, you can attach the porch. 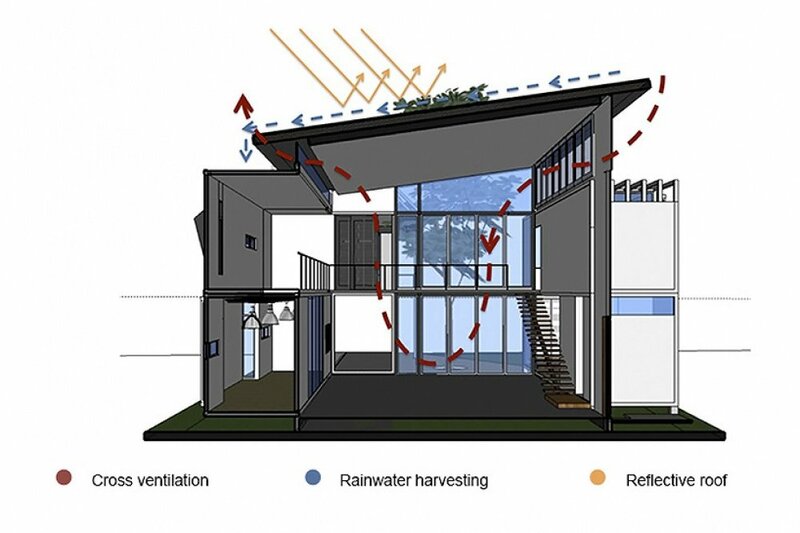 Due to the universality of these elements, they are sometimes combined with the standard materials used as component parts of traditional home. 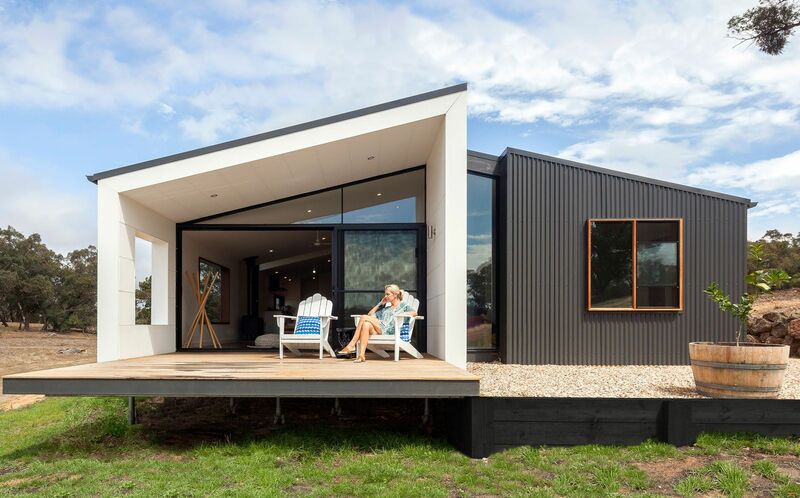 Show imagination, carefully thought out design, even with minimum investment will be able to erect a building to be quite functional and attractive. 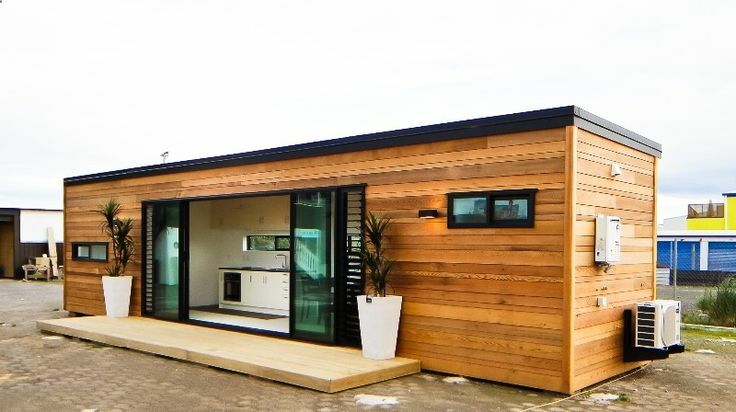 For clarity, let us consider some examples of finished buildings. 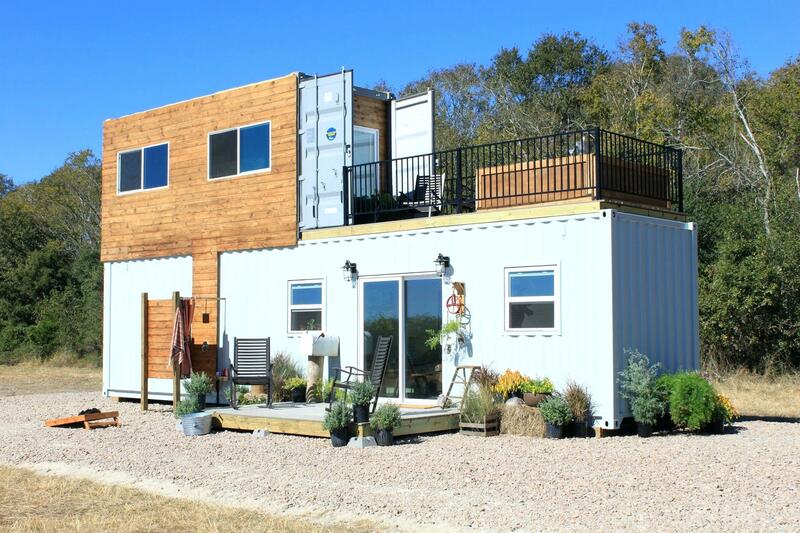 One large 40 or 45 – foot container it is possible to build a small house. However, we must remember that its inner area, excluding finishes, will be 31 to 55 of 27.95 m2 and m2, respectively. 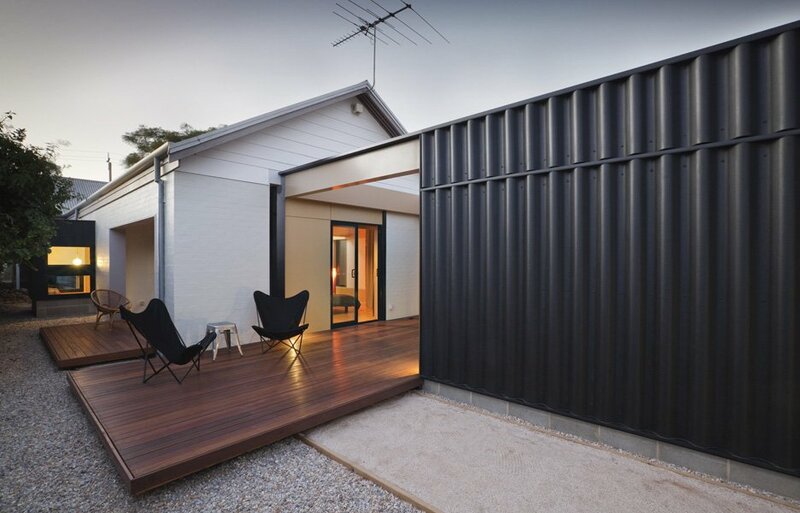 Such a structure is more suitable for the garden, as a guest option. On an ongoing basis it will be able to accommodate single people, families without children and pensioners. 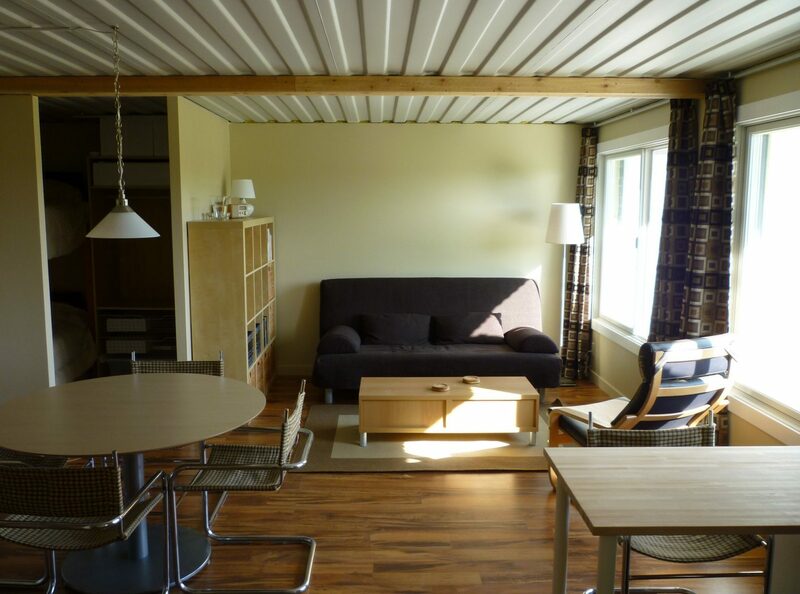 The area is comparable to the Studio apartment. 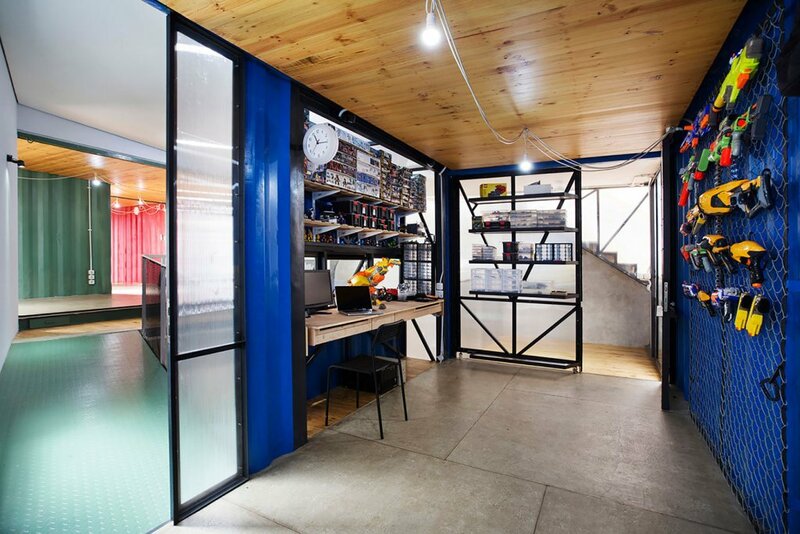 When planning the internal space can be use the examples the arrangement of the studios. Here we get to arrange kitchen, combined bathroom, equipped with a place to stay. With proper planning, using the circuitry, within a single room can be organized in several functional areas, allocate space for a living room, workspace, bedroom. 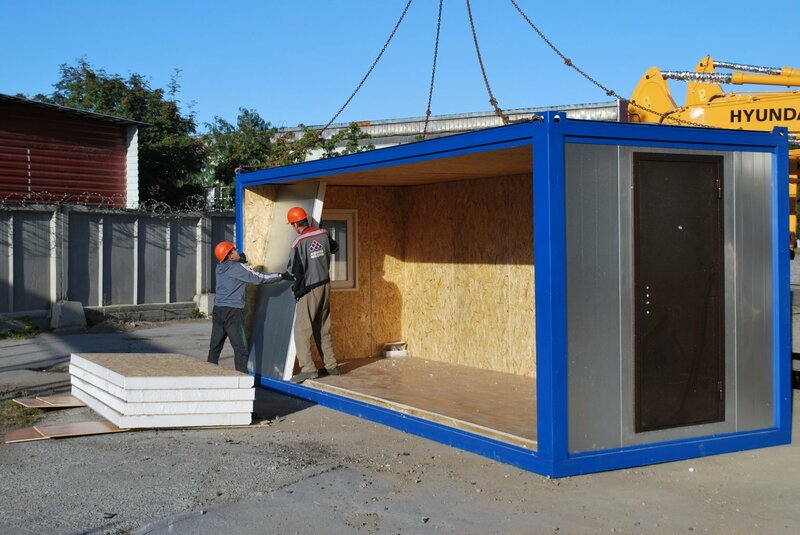 Installing on your site 20, 30-foot blocks, you can get a tiny housing with an area of 13.67 m2 and 20,81 m2. To organize living space in this case is much more complicated. Will have to save on everything in the bathroom to use the shower, the kitchen also must be reduced, to allocate a place near the bathroom, as close to the sanitary communications. At the organization of the room should consider the use of transforming furniture. To install the bed that you can hide in a niche. On the walls you can arrange shelves, lockers for storage of various items. It is better to combine living room with dining area, bedroom with Cabinet. To visually increase space on the partitions and the ceiling and put mirrors. 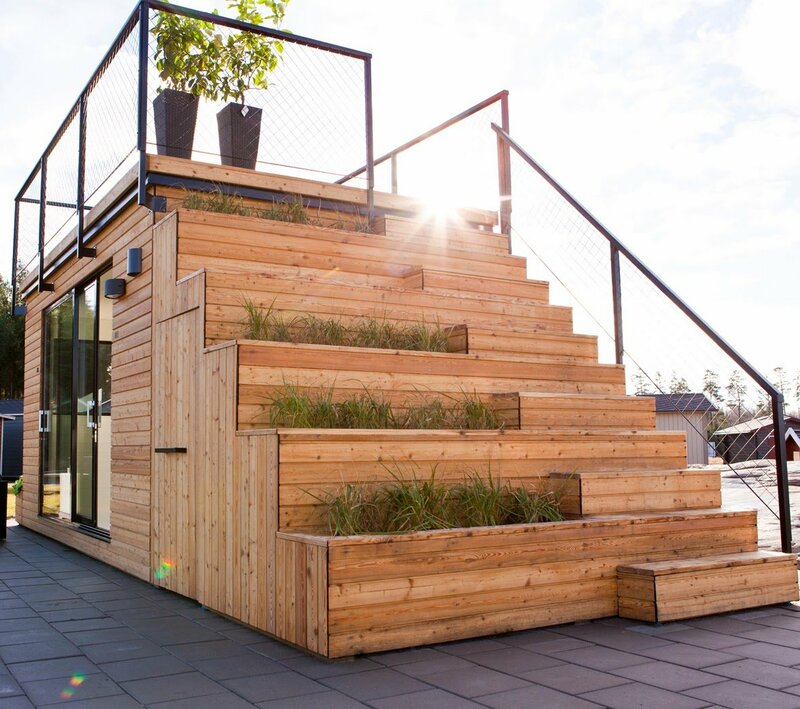 The option of the external staircase is often used when the organization of the huts, installed on top of each other. 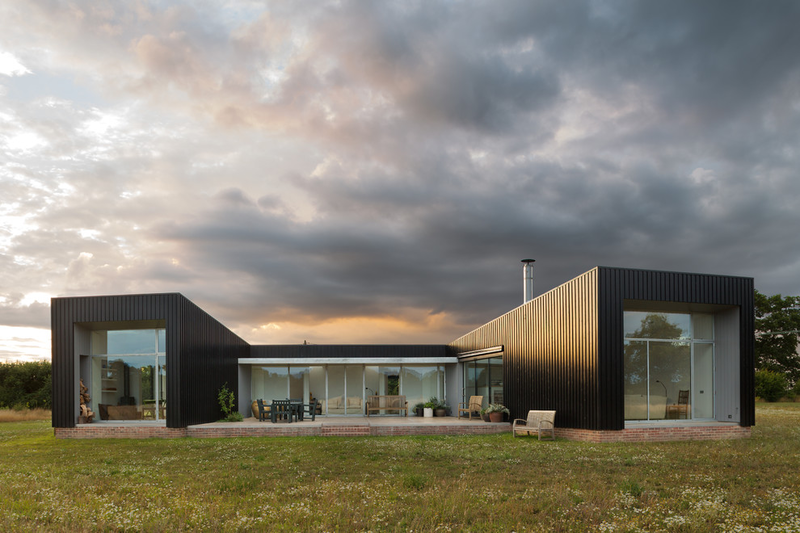 Similarly, it is possible to build a country house purely for seasonal use in winter would be problematic to move between the floors, constantly down in the kitchen. 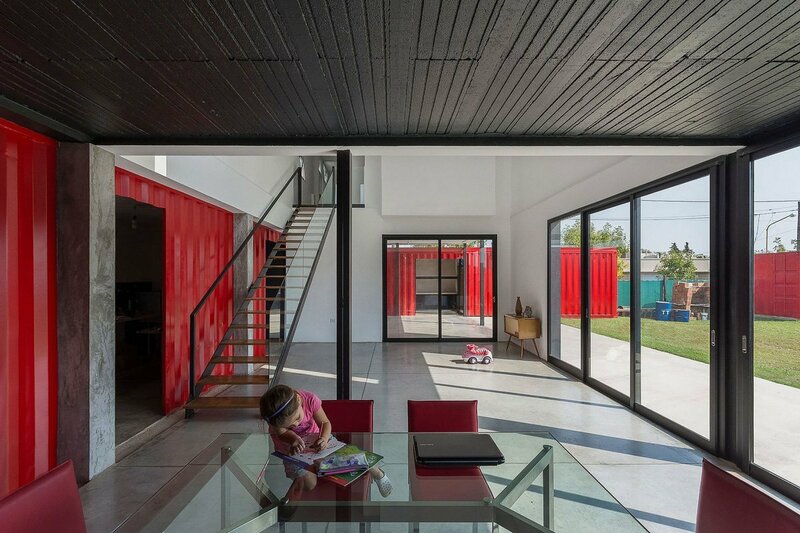 This method allows you to save internal space, reduces construction costs. 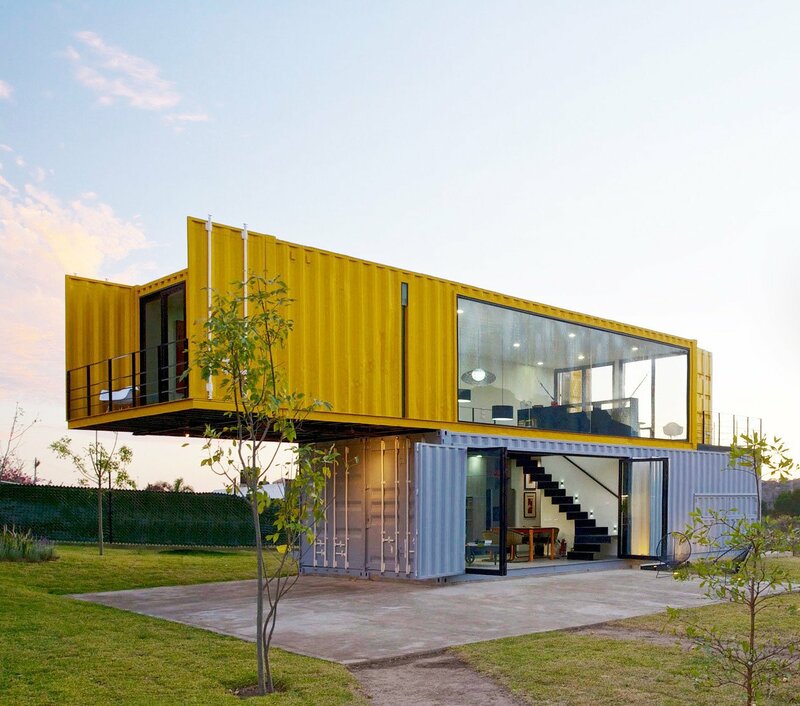 Place the containers in two ways: in one direction, perpendicular. The second method is more practical. 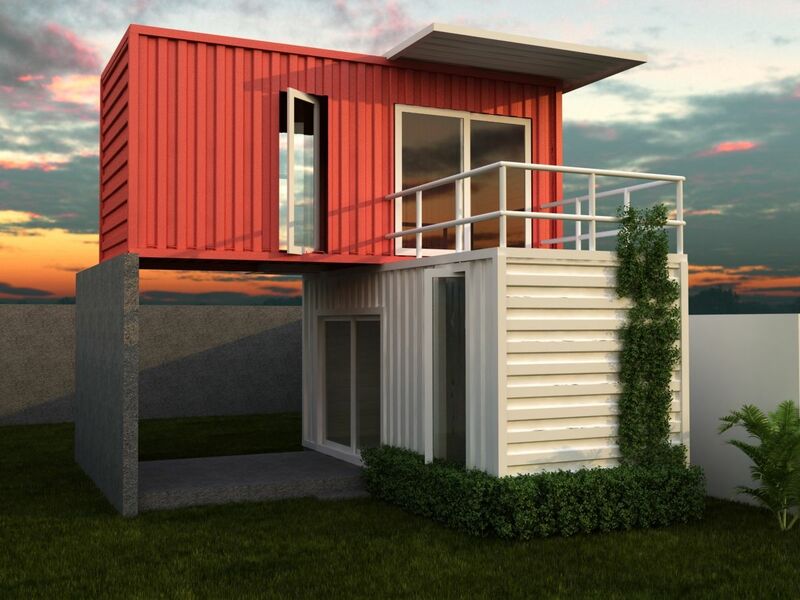 With this arrangement, the bottom equipped with a small terrace on top of the balcony. Some owners of such structures manage to involve even the roof, extending a stairway to the top. Here they set up a place to stay, a meal in the fresh air. 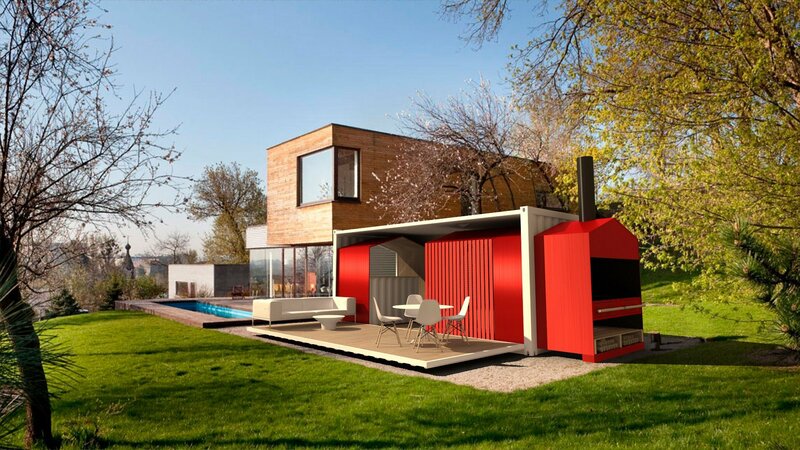 Compact house in the country is used for storing garden equipment, a comfortable place of rest in the summer. The main feature is the combination of compactness and functionality. 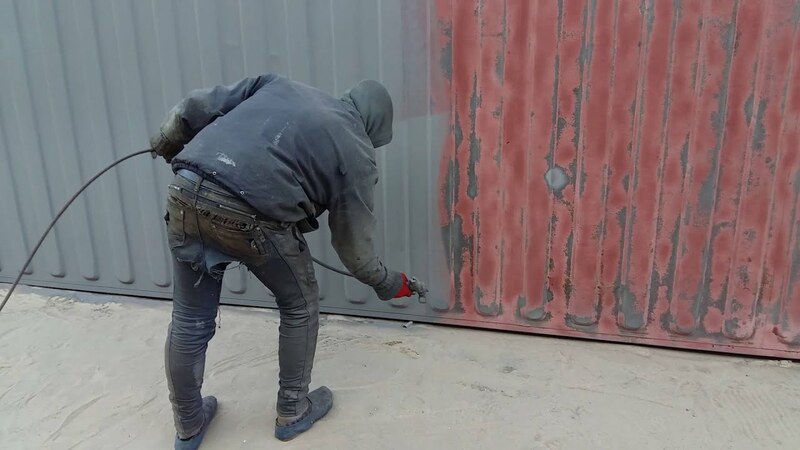 On the construction, you can save well, as in most cases, such a construction does not require high-quality insulation, the organization of serious heating system. Enough to hold the utilities to perform an attractive finish. 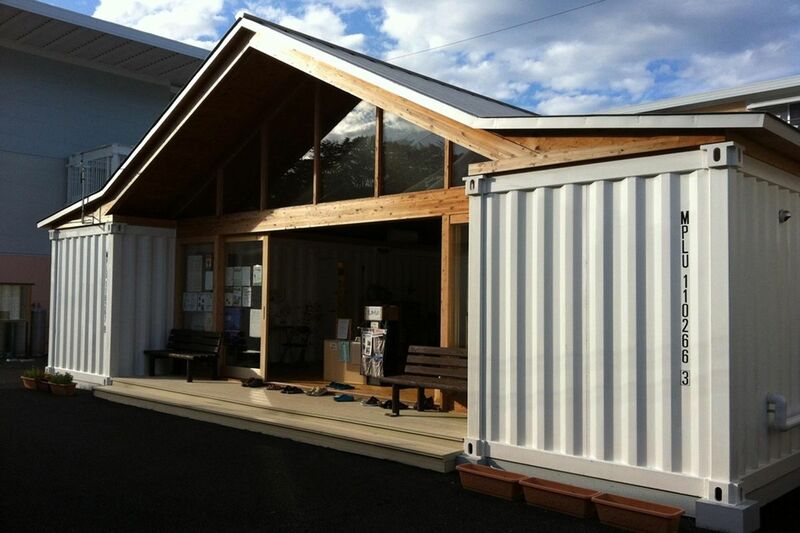 For the construction of holiday option will be enough of one container. With proper planning, it is possible to allocate a zone for relaxing, cooking and eating, a separate area for the arrangement of utensils that are required when caring for a small garden or garden. 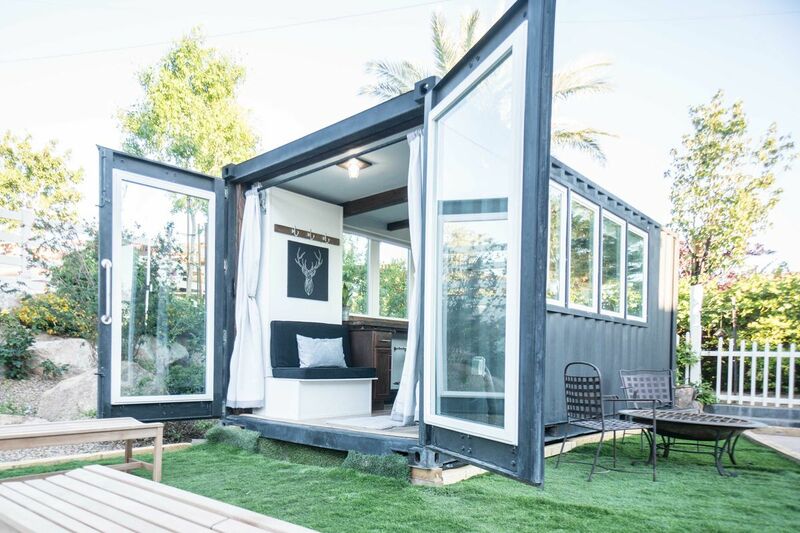 Some people, accustomed to comfort, using the garden area for leisure activities, can build a more functional structure, two or more modules. With a little imagination, using reusable packaging, you can organize a small workshop equipped for specific tasks. This model is suitable for people engaged in shoemaking, sewing, carpentry, plumbing craft. For these purposes, allocate as a unit, and its separate part. The main thing – the whole instrument must be carefully stored in one place, available space for activities. 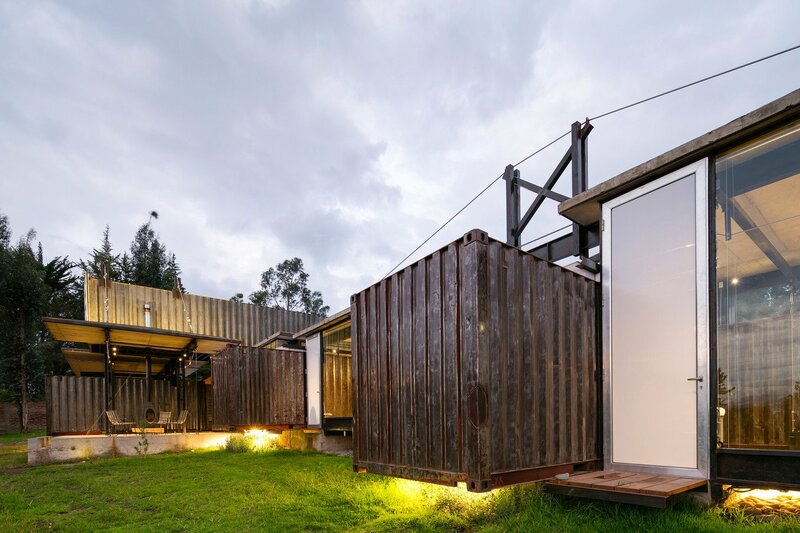 The simplest project consists of two separate modules. One of them is used as a residential, second – for household needs. At the workplace one part provide for racks and shelves, provide a corner under tools for cleaning, have it safe for disposal. 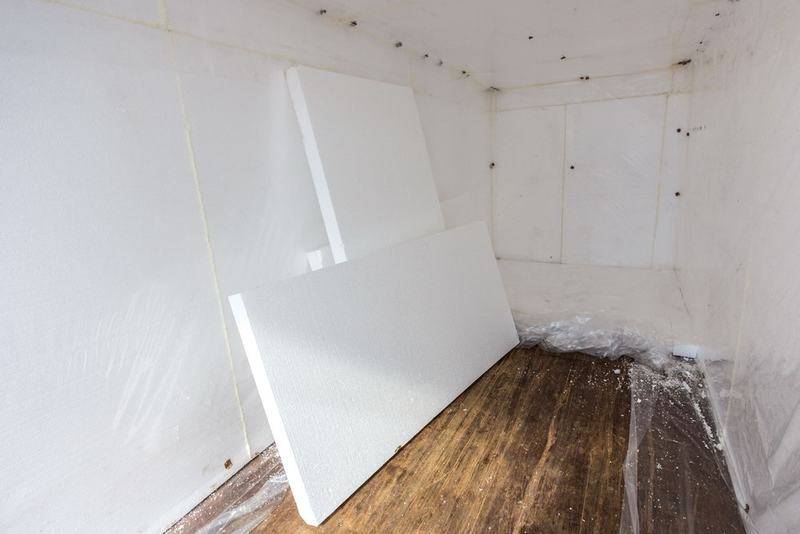 Carefully think through and choose an area for the storage of blanks, finished, repaired product. On the perimeter walls to hang wall cabinets. Pay special attention to the working area. 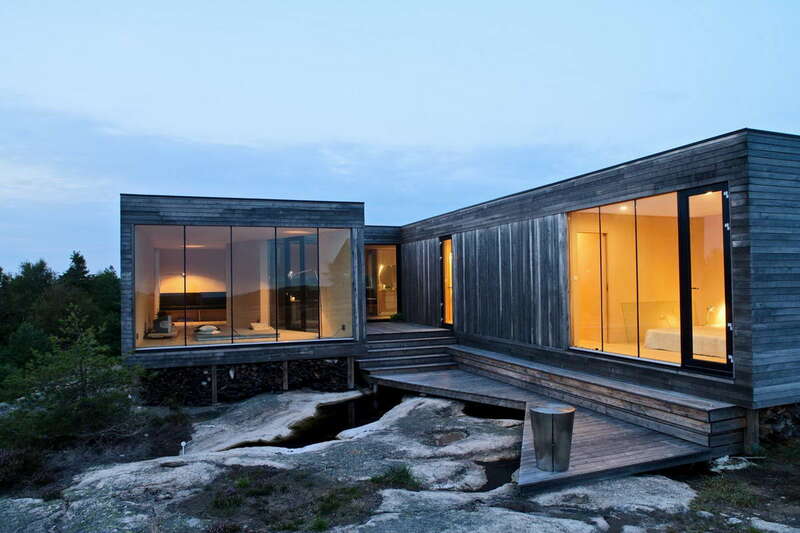 The main feature of such construction is that all rooms are rectangular. And this does not change if the organization of internal space to rely on regulations. According to 31-02-2001, SNiP 2.08.01-89 and more recent editions, the kitchen area should be 6 m2, bedroom 8 m2, lounge 12 m2, therefore, internal width 2.33 m, square room is unacceptable. 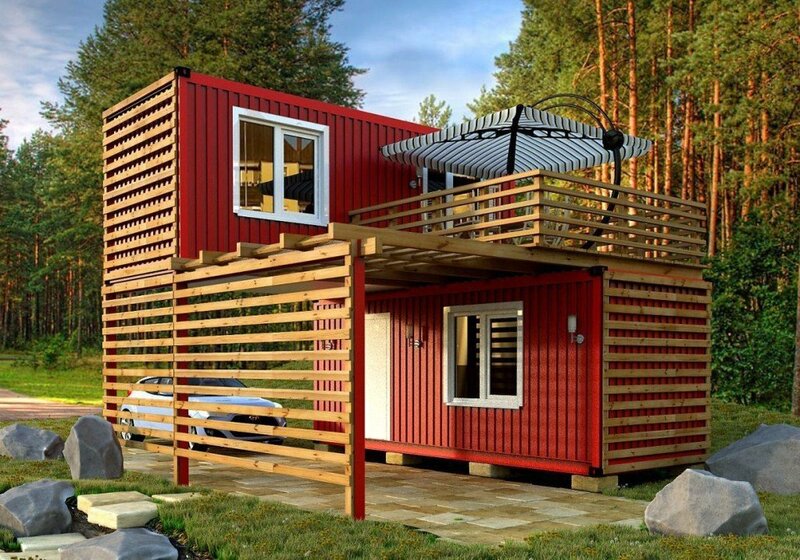 To build a one-storey construction, can be of different sizes. 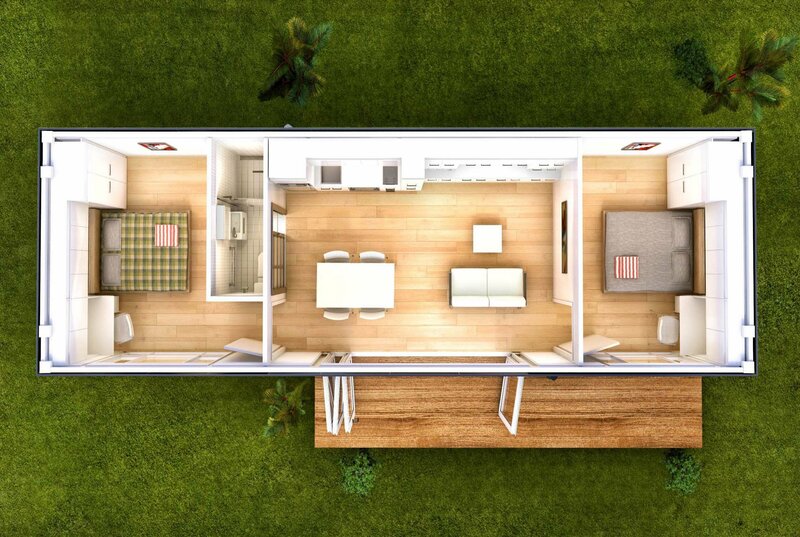 When connecting multiple units get quite large building, suitable for living a full family. 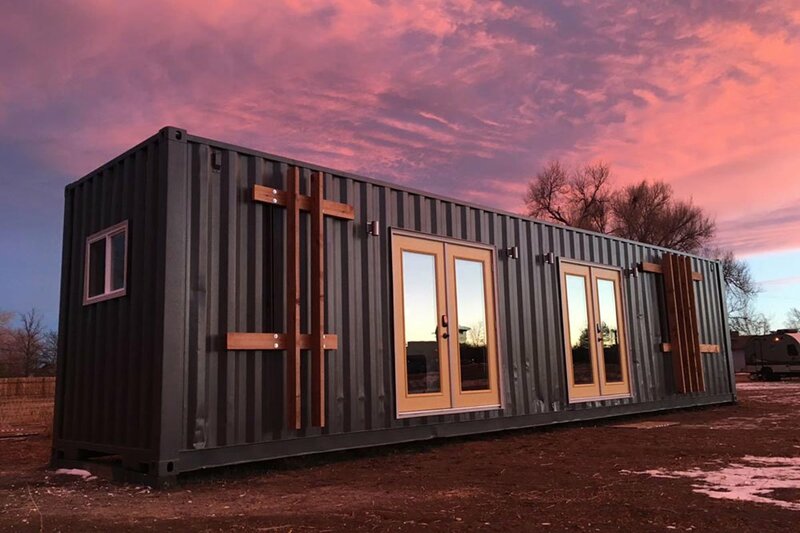 A huge drawback by dividing one container into several functional areas, will be passing their location, except for the compartments that will be located at the center of the long side. 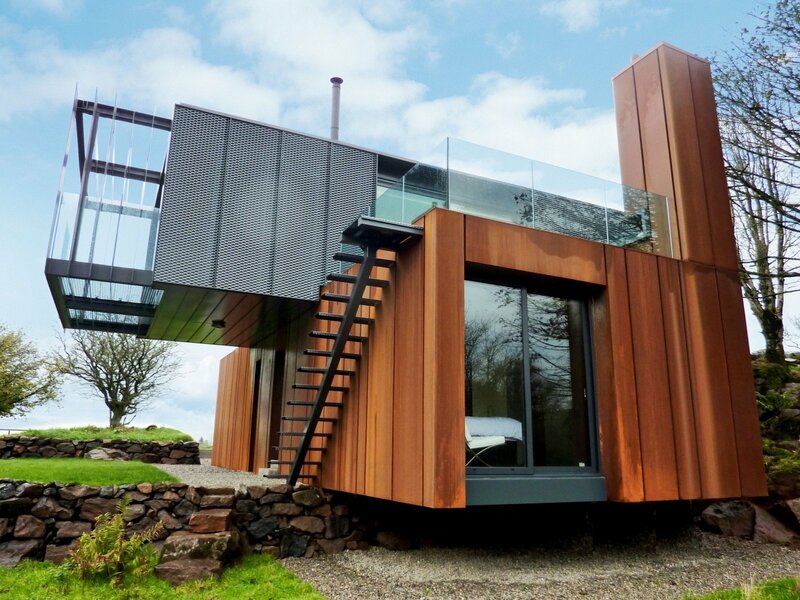 With proper planning, applying quality finishes, you can create an attractive and functional building consisting of two floors. 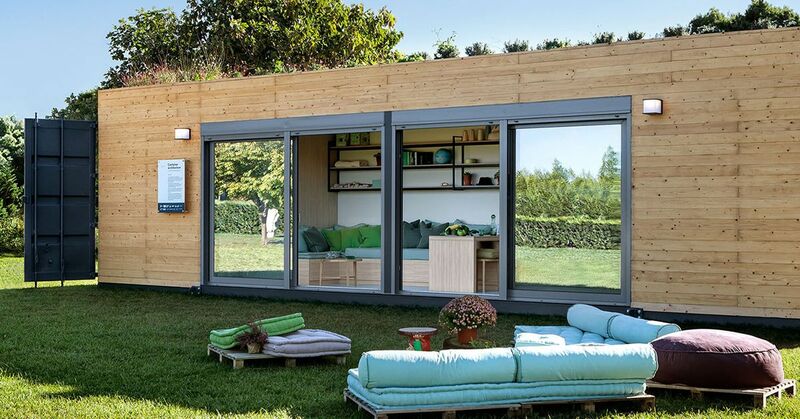 It can accommodate a family consisting of different generations. 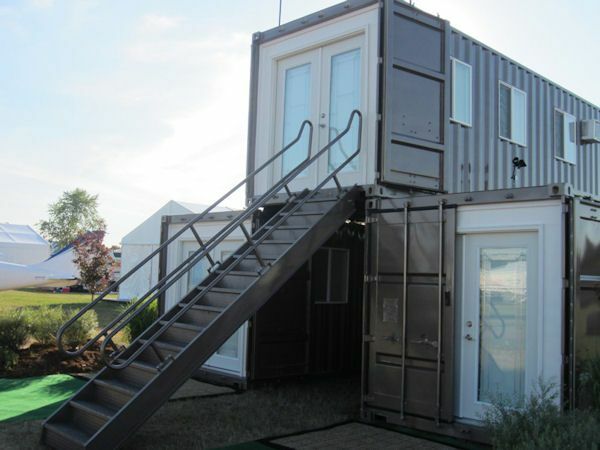 But it all depends on its size, number of used in the construction of units. Separately it is necessary to take care of the organization of the flight of stairs, according to SNiP 2.08.01-89 p. table 1.24. 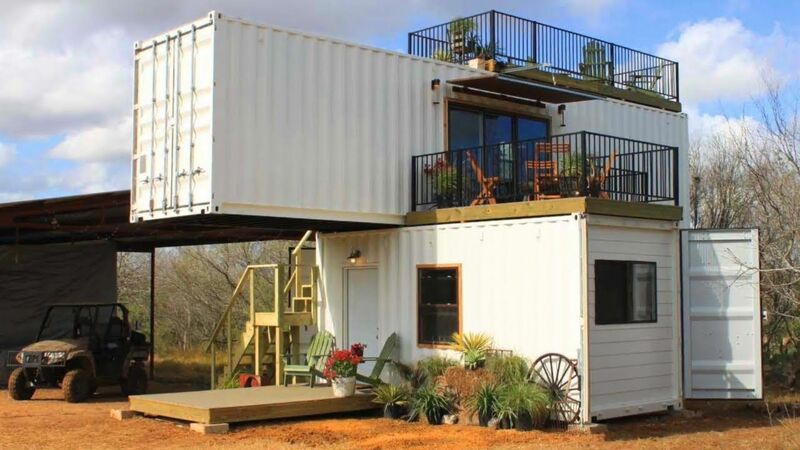 3, it should be not less than 1.05 m in width, and hallway – 1.4 m.
The simplest version of the construction of two-storey construction represents the two containers mounted on top of each other. At the first tier includes the kitchen and dining room, bathroom, boiler room, on the second render living room. 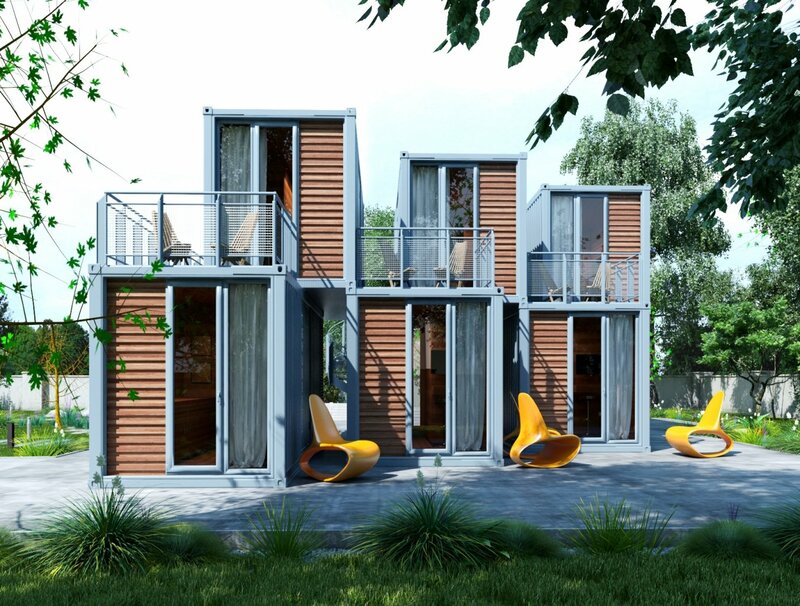 When using more than two blocks, it is possible to provide multiple bedrooms, office, nursery, other functional areas. 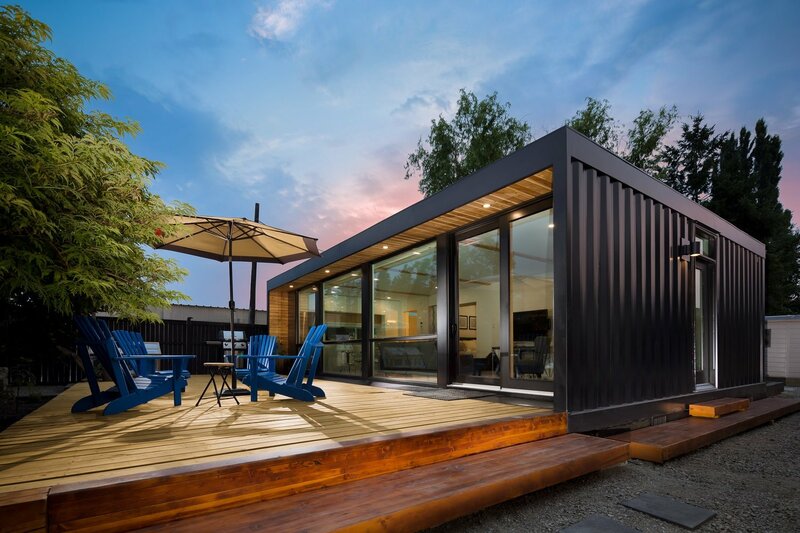 To organize the construction of a terrace of two containers in several ways: to make a one-story structure with an l-shaped layout, put two modules perpendicular to each other. 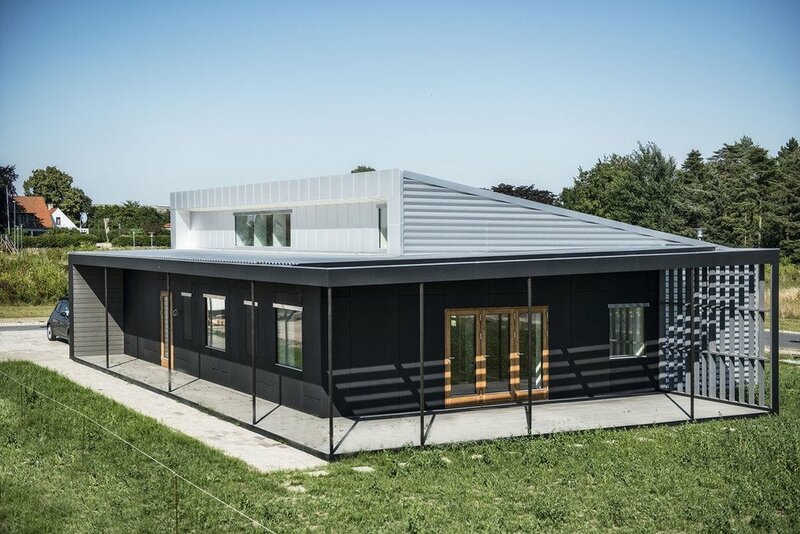 In the first case, get an open platform based on the building from two sides, the second – partially or entirely located under the roof, attached to only one side. 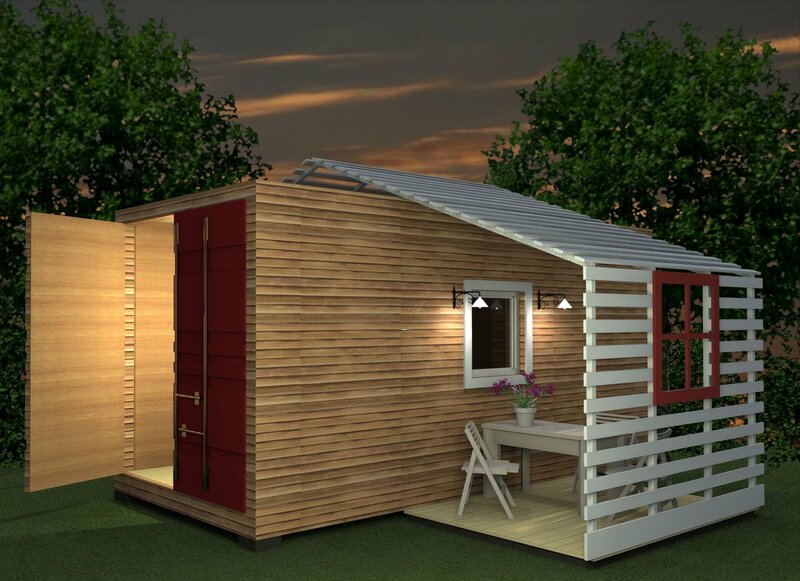 The traditional outhouse is made of wood, has wood flooring and fencing. For the flooring it is better to use special decking, which is characterized by a long service life. To place the design it is recommended that South, South-West side, its size depends on the size of residential structures. 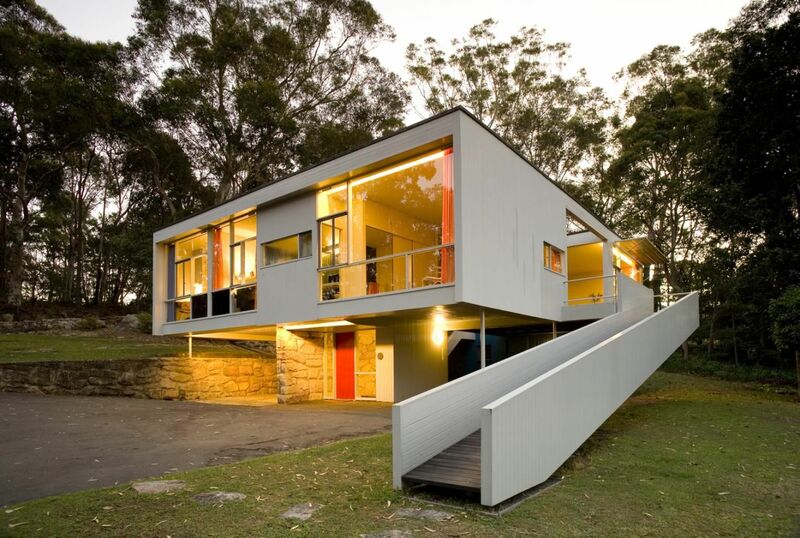 The design should match the design of the house. 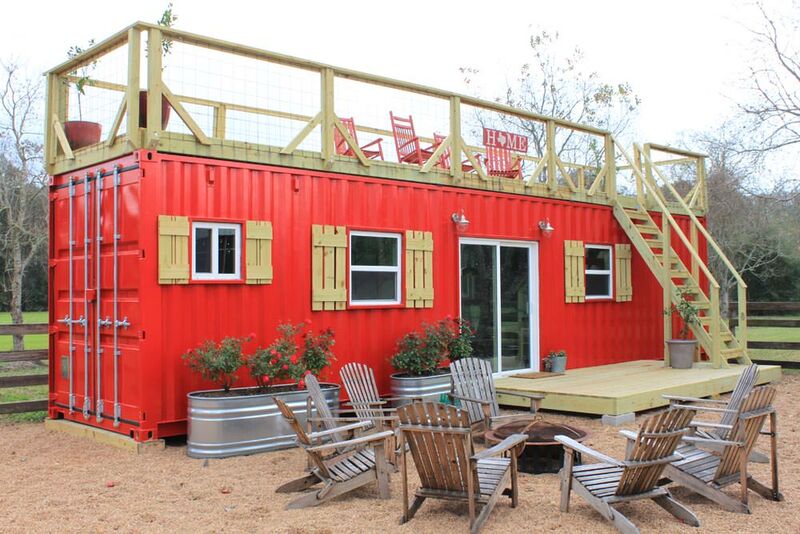 You first need to purchase one or more containers. They should be sure to check for radiation, because it is in such containers is collected remnants of harmful radiation. They must be without dents and other defects. 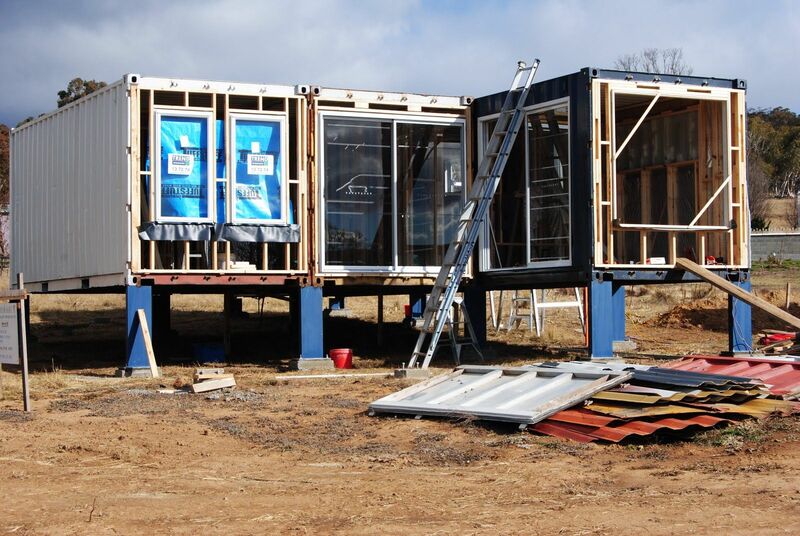 Before installation, house from containers, you must draw up a detailed project plan of work. 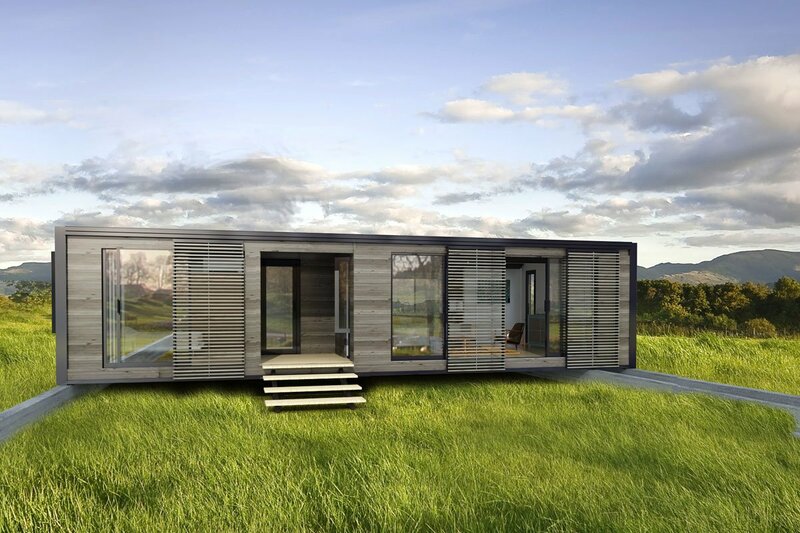 Should pre-determine the size and number of modules, if it is to accommodate a large family. The construction of Foundation is the first and most important stage in the construction. 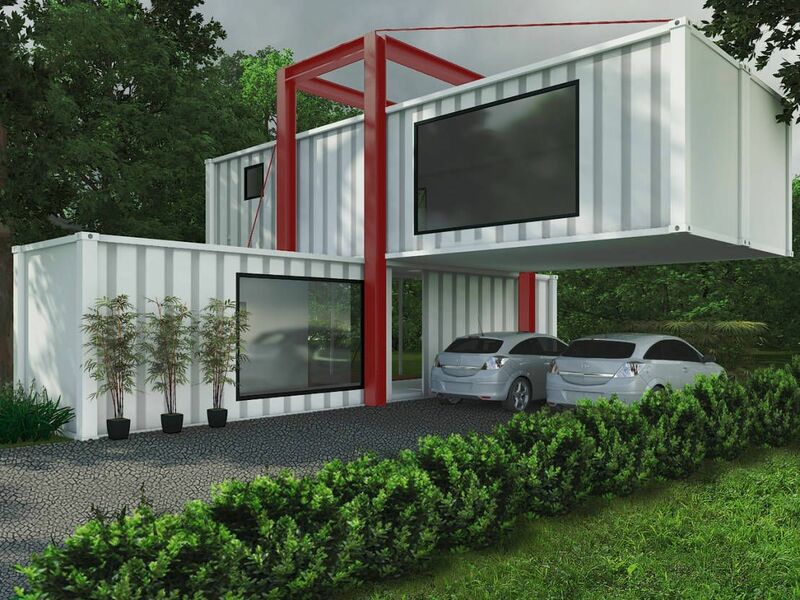 Setting a simple ground impossible, because the heavy container will result in substantial subsidence of land. In the winter the floors are cold, finishing materials you will freeze. 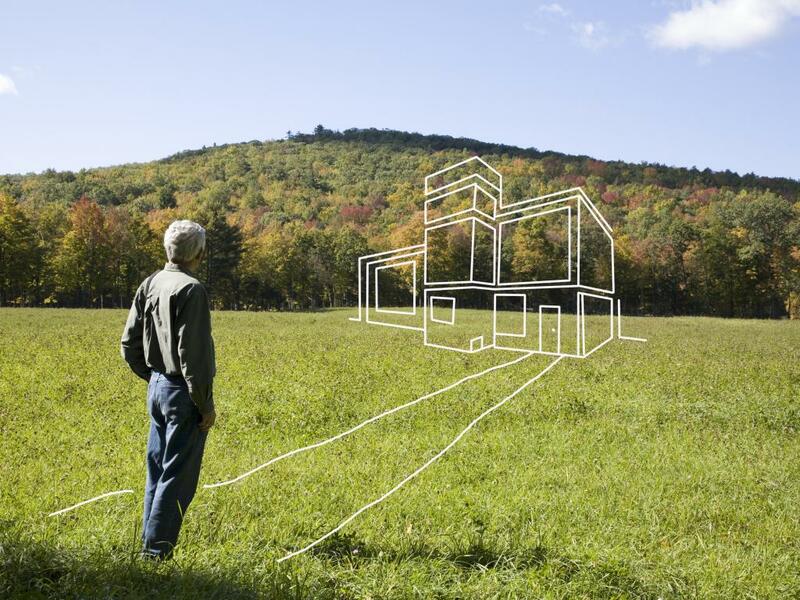 If you select the Foundation you need to consider the size of future homes, the terrain. If this is a common shed for temporary accommodation in the summer, will be quite a few Foundation blocks. In the preliminary preparation of the base needs of a residential building of several floors. This is usually used reinforced strip Foundation. In areas with boggy soil can not do without the piles. The function of secure base can only perform a monolithic Foundation. For first dig trench and fill with a mixture of cement, sand and water. For more strength add various Summerdale. For pouring the Foundation, you can use a ready-made mixture. In this case you will need to make the armature frame in the drawing, set the formwork, pour the solution. To compact the concrete, a special vibrating tools. 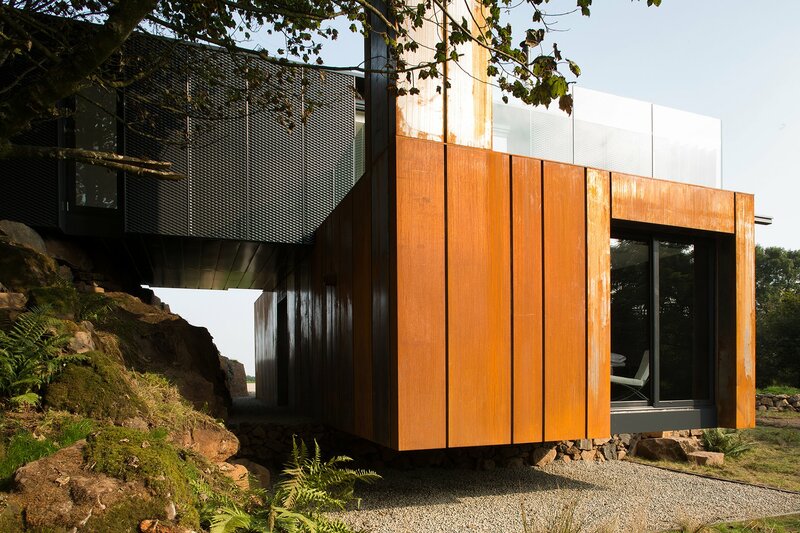 Any metal structure (shed, house) are susceptible to corrosion. She is in constant contact with the external environment – sun, water, wind. Inaction at the first appearance of symptoms of the disease will lead to dire consequences. Dip galvanized. 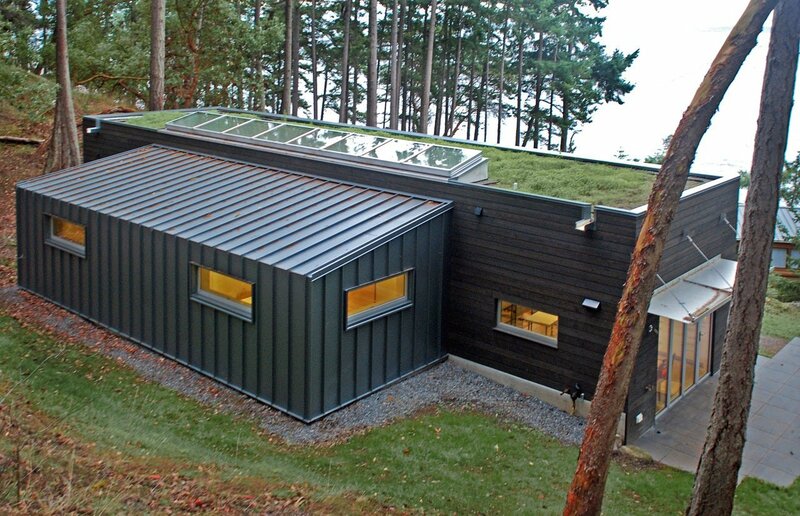 The exterior walls and the roof is covered with galvanized sheets for reliable protection design. 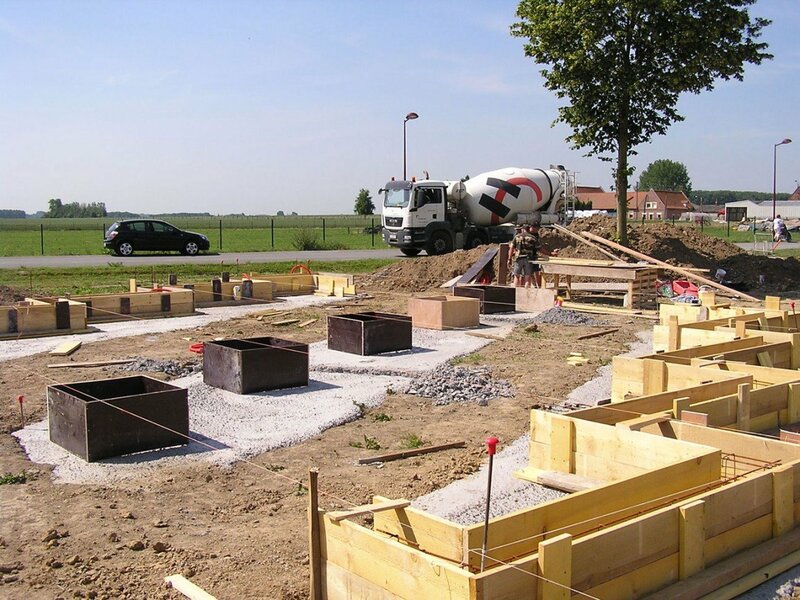 After pouring the Foundation you will need to wait at least 25 days. 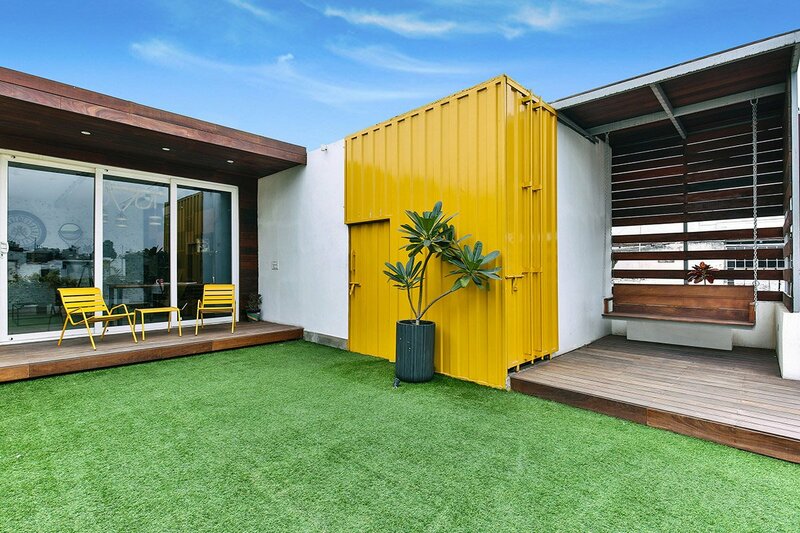 When the concrete has matured, you can start the containers. This will need to enlist the help of crane. 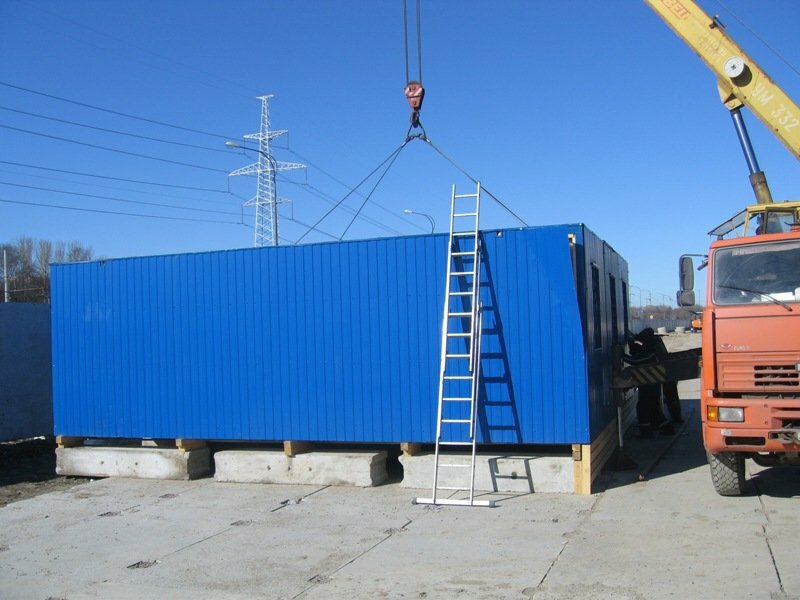 Installed modules it is necessary to fasten together with iron angles, rectangular pipes with welding machine, gasoline generator. 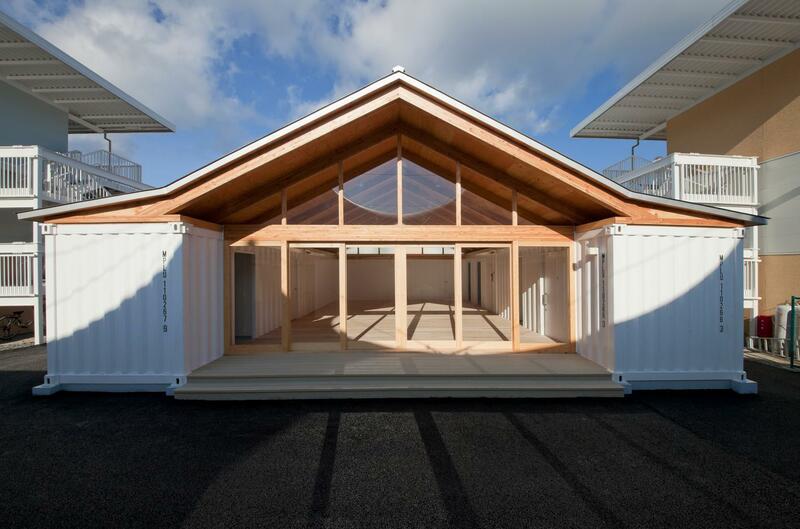 The container space is divided into zones with sheets of drywall in accordance with the plan. At this stage, cut Windows and doors. Using modular blocks of different size, you can build the author’s construction with an unusual design. Laying of galvanized sheets. It is necessary to provide for ventilation. Shipping containers due to the specific structure and type of material allow very good sound and does not retain heat. 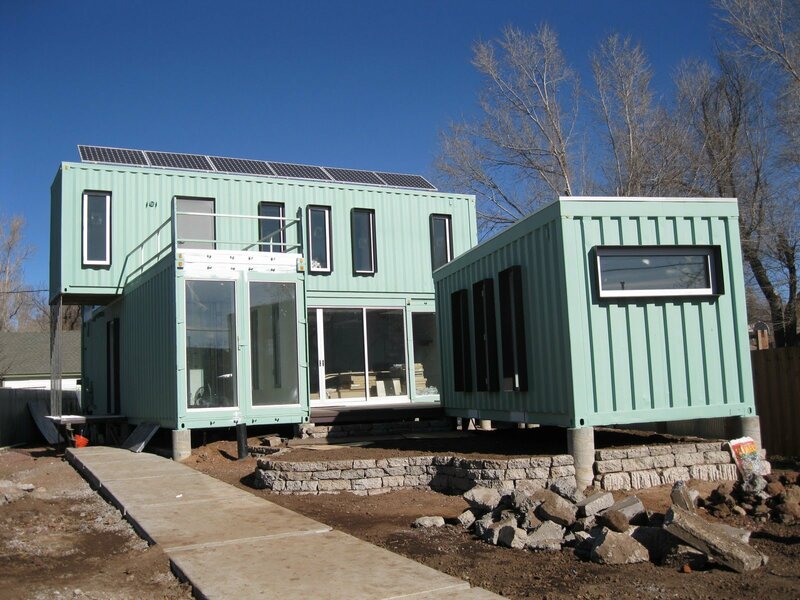 The building of these modules must necessarily be insulated from the outside. External insulation is much more effective than domestic, since it completely eliminates the heating of the metal. To achieve the best result possible if you simultaneously use both options. 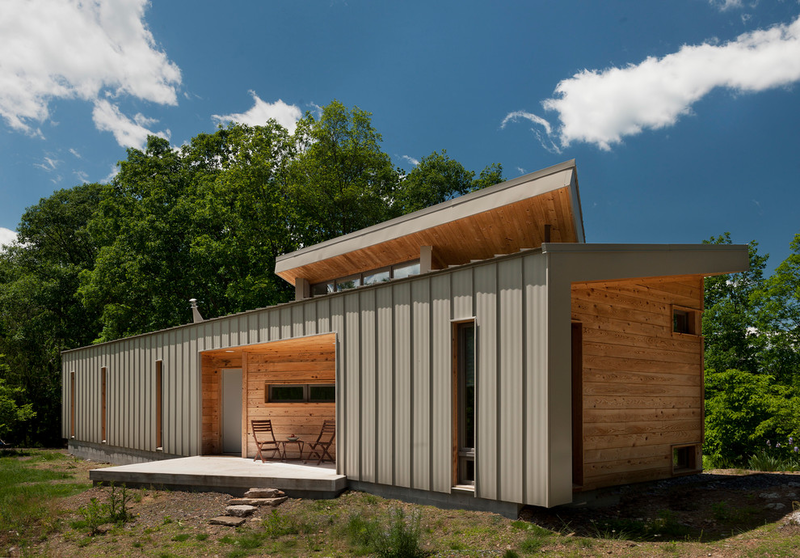 The lining of the walls from the street are doing with the help of corrugated sheets, siding, wood and other. Board materials krepjat to a wooden crate with screws. 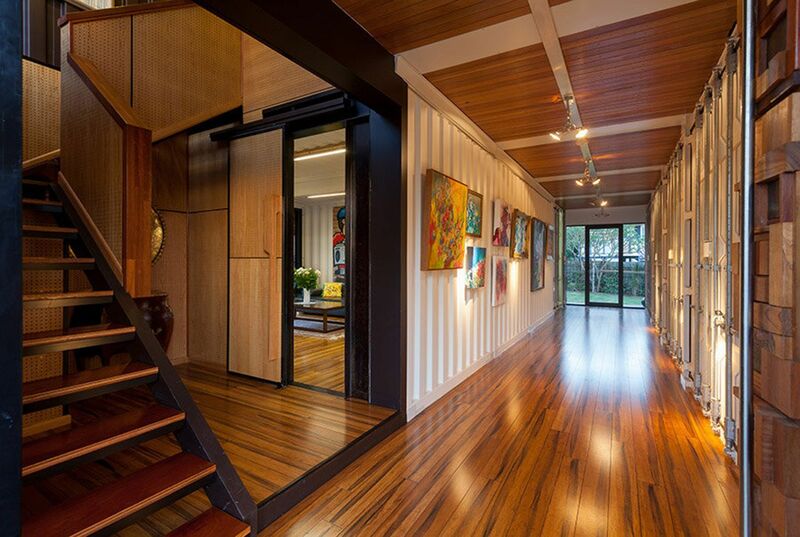 The space between the container walls and decorative trim can be filled with mineral wool to fill with foam. Comfort depends on the availability and characteristics of engineering services. Proper design and quality installation will help prolong the life of the house, to reduce the number of accidents. Electricity. Cables are laid in special channels that are allowed for internal walls. Gas. Implementation is possible at a close location of the pipeline. Heating. Often use fireplace metal stove. Usually make two vent holes located opposite each other. 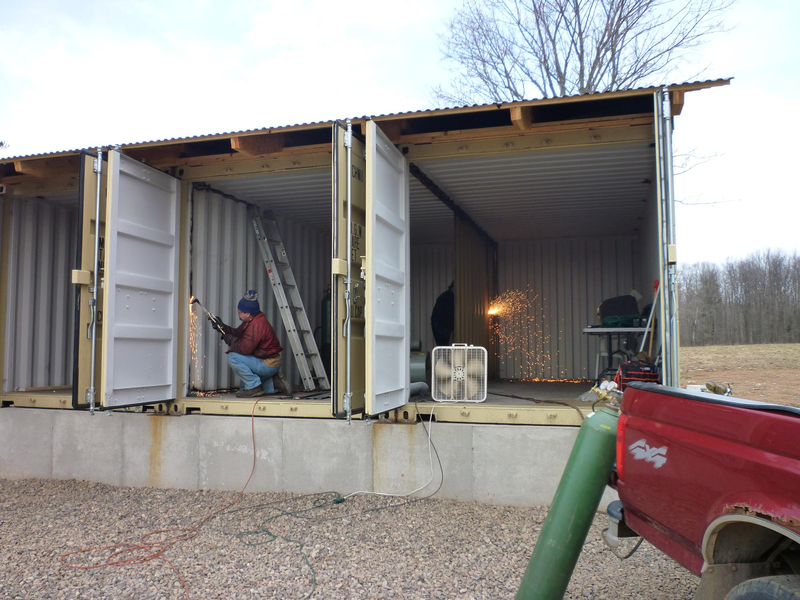 From the end of the container and cut the pipe output on the roof. Thus will be the air supply. On the other hand do the release, mount the fan and hood. For the area of one wagon will be enough device with a diameter of 100 mm. should Also set the adjustment valves. You can do the two tributaries on the edges, and the hood in the middle. The choice of the variant depends on the temperature outside, number of guests and other factors. 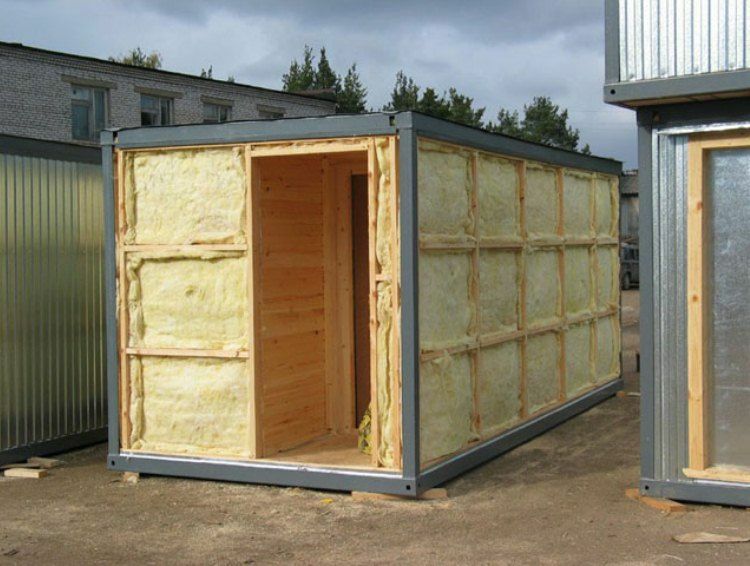 Insulation with mineral wool. The material is laid on the foam. Then stuffed the crate for future installation of plasterboard, plywood. 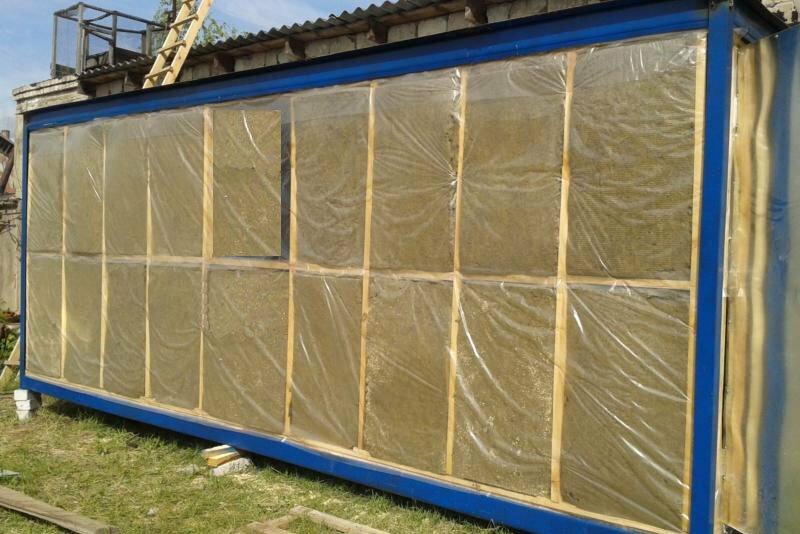 Frame with insulation, you can close any material. Suitable paneling, drywall. The joints of sheets glued construction with a bandage, then paint the entire surface with latex paint based latex. 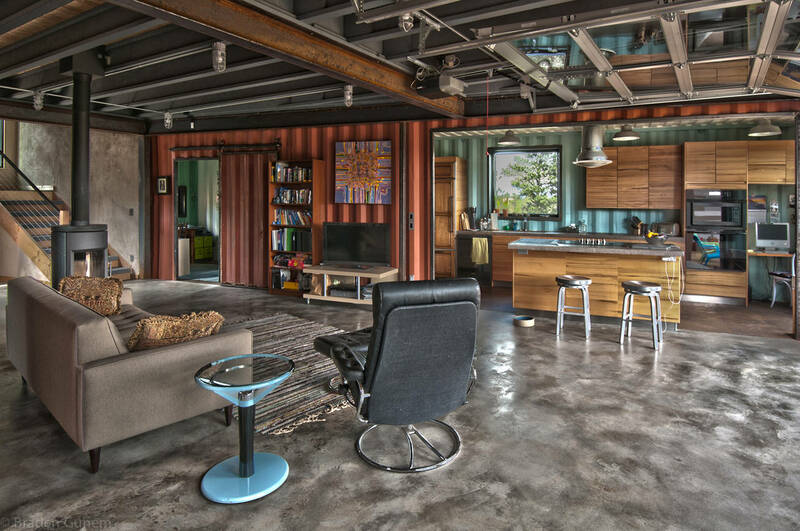 Home of the containers do not limit their owners in choosing the style, and architecture. 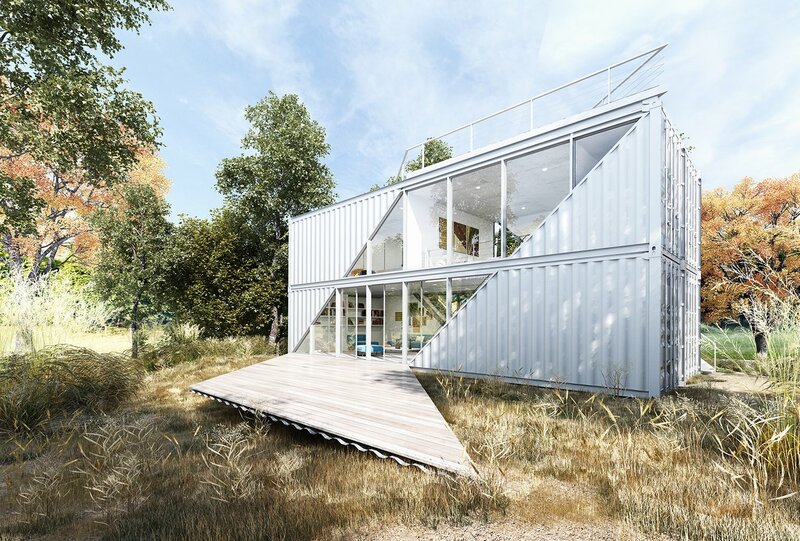 This design is more suitable for modern design of high-tech, modern, loft. Will look interesting house with large Windows and sliding glass doors. Original look country built in a rustic style. 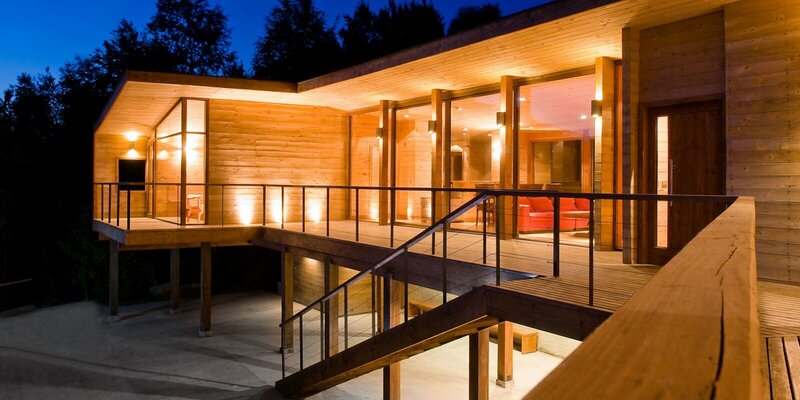 Exterior, interior wood finish fills the room with warmth and comfort, plus closer to nature. 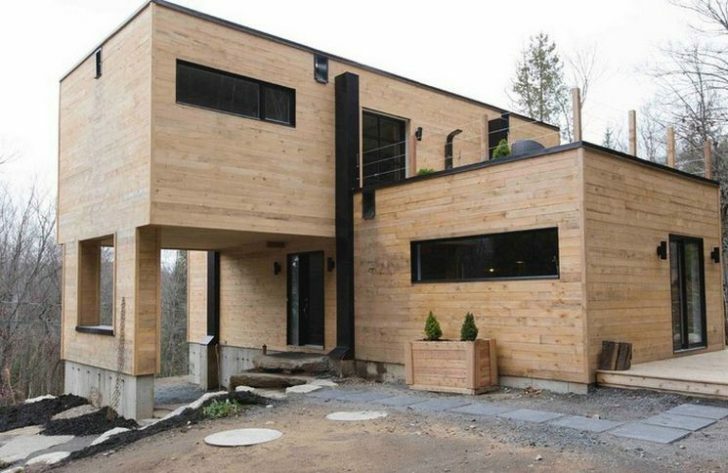 Wood siding hides any hints on a metal frame. 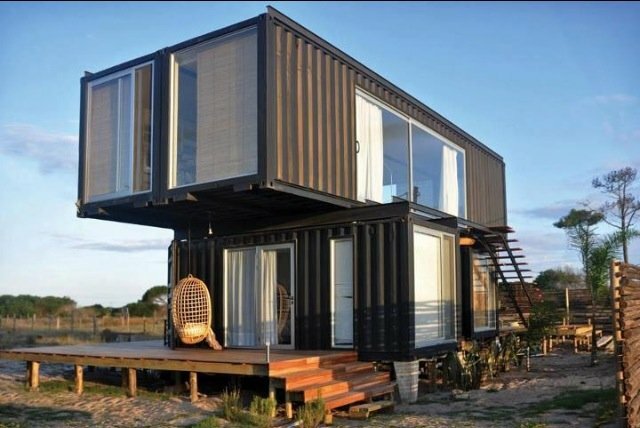 House of block of containers is a functional and attractive structures, which are very popular in many countries around the world. 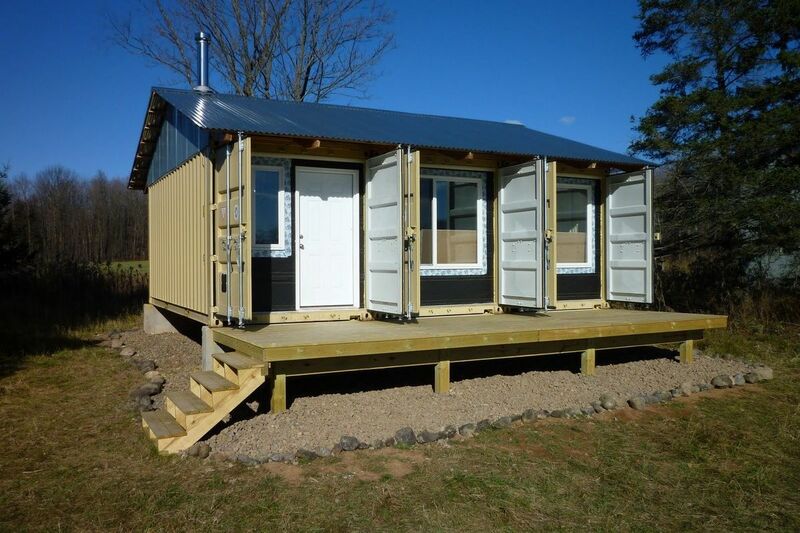 With separate units you can build a budget accommodation building suitable for seasonal and year-round. 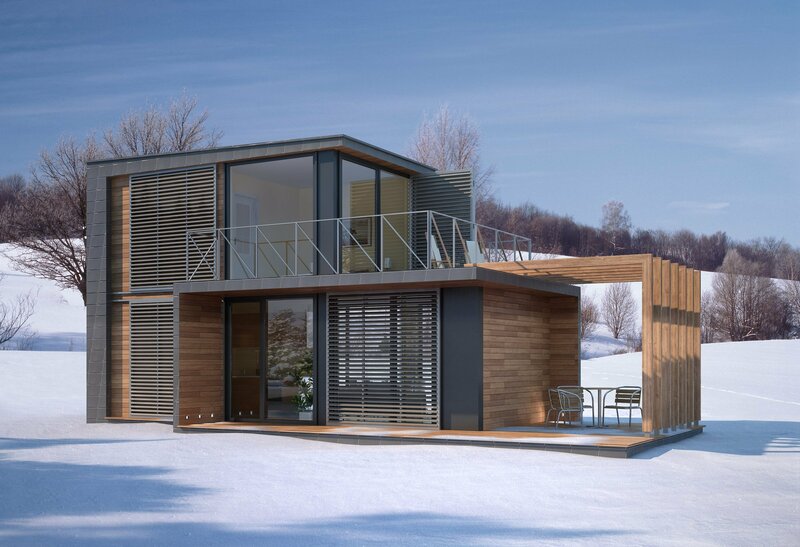 This model will be indispensable as a holiday option, a guest house, a complete housing for families with children, consisting of several generations.